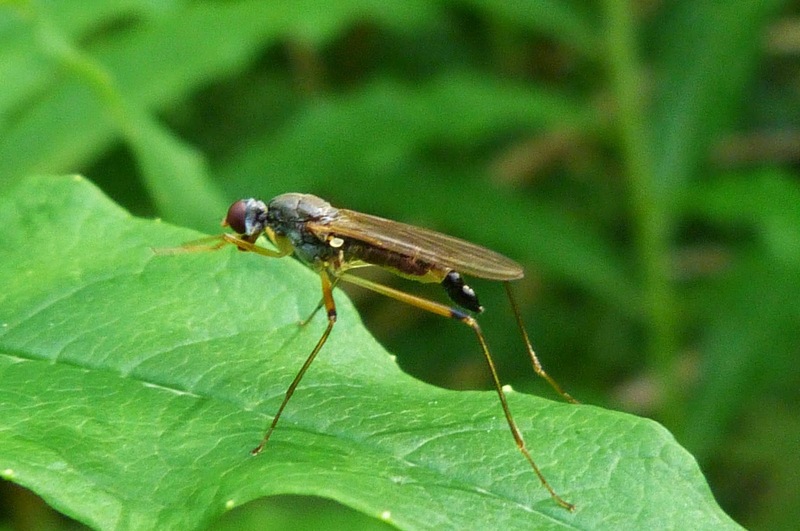 The males rounded abdomen on the left can clearly be distinguished from the females abdomen which ends with a narrow, pointed ovipositor on the right. The wings are clear with black irregular strips and black dots at the wing tip. 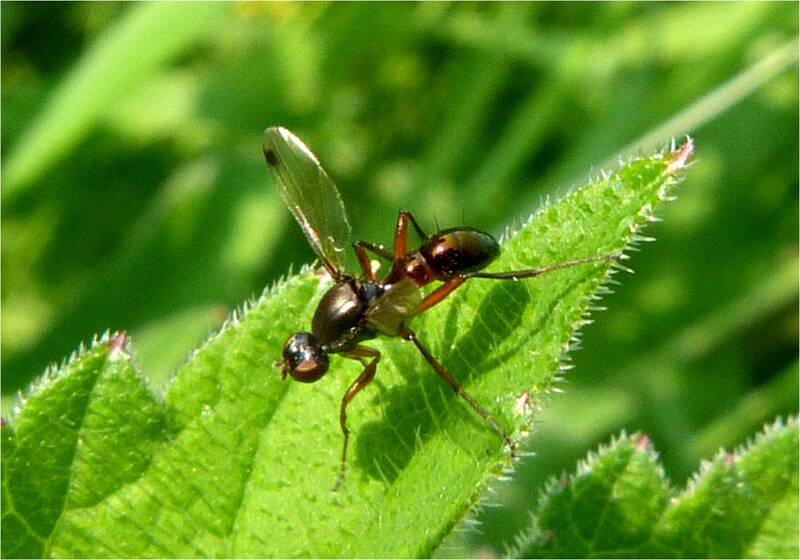 Except for their patterned wings, they look rather ant-like. As far as I can see, the term 'picture wing fly' can apply to any of these two winged flies that have patterned wings, including fruit flies. 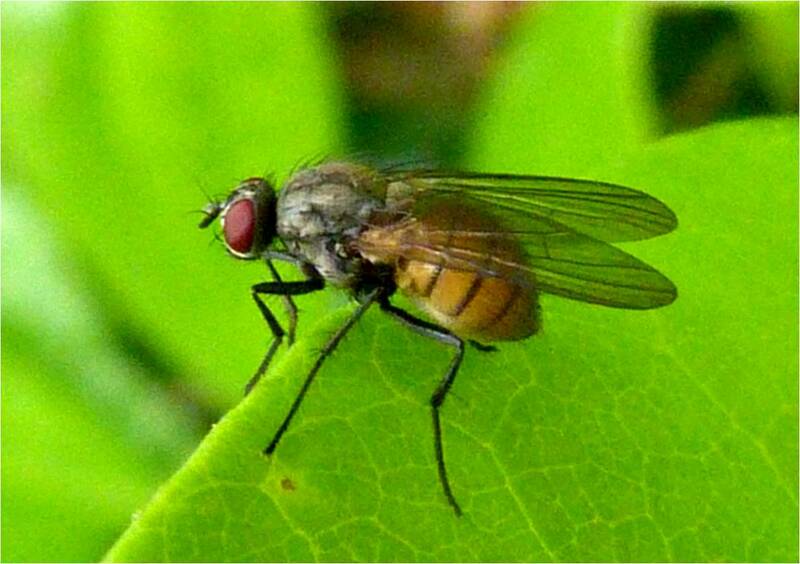 Also known as the hawthorn fruitfly. 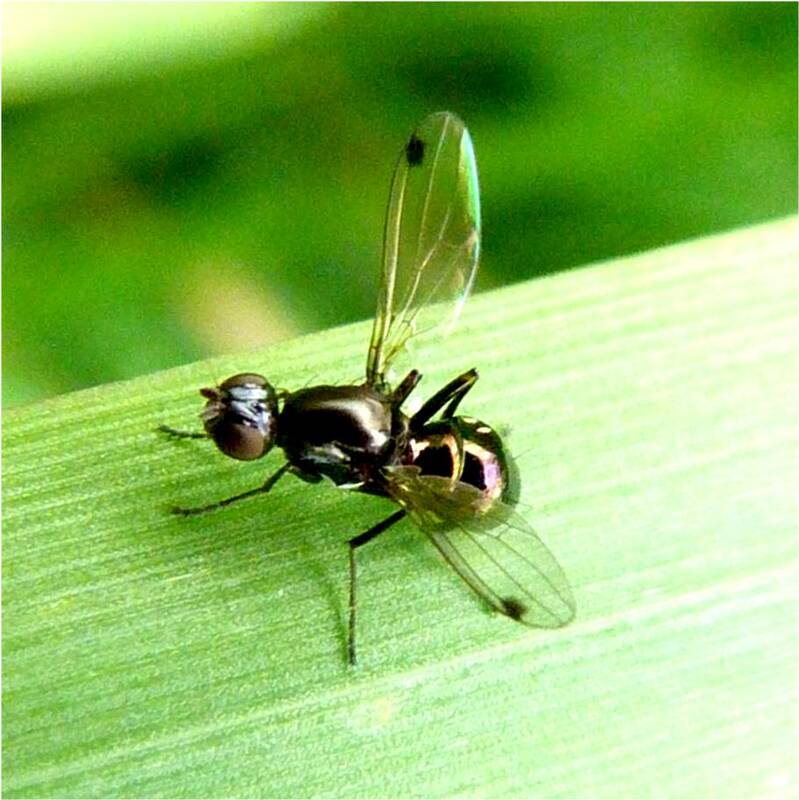 These tiny flies have large iridescent green eyes, a striped abdomen and clear wings with peculiar radiating black lines. 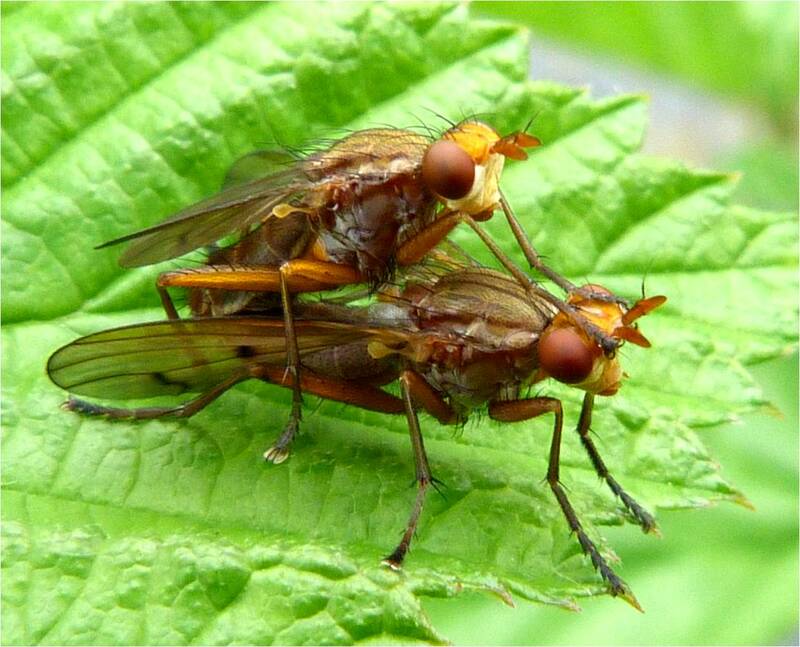 The only difference between the sexes is that the male, as here, lacks an ovipositor. 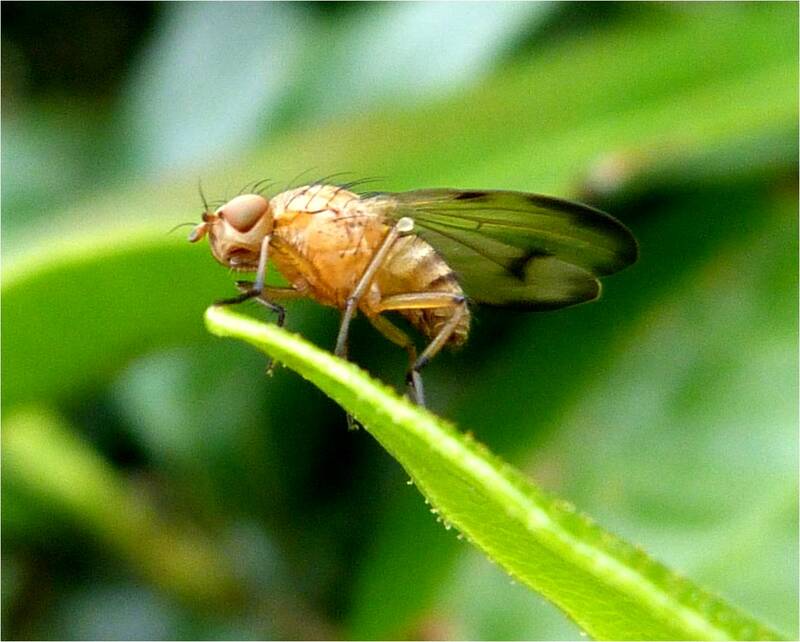 Fruit flies are well-known for sharing almost 60% of human genes i.e. 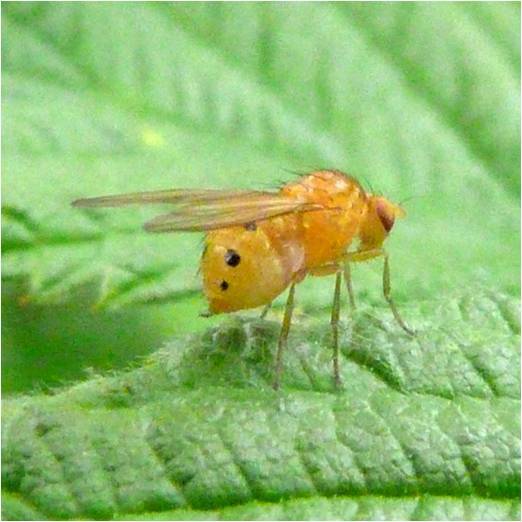 we are genetically very similar to the fruit fly which makes them ideal subjects for genetic experiments. Looking at these pictures, it is difficult to imagine which 60% we share exactly. Fruit flies were also the first animals in space. 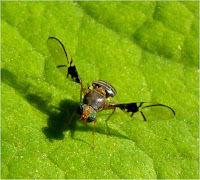 There are also some interesting articles circulating at the moment about a fruit fly that appears to have evolved to have pictures of ants on their wings. They apparently have evolved this way to frighten off predators. 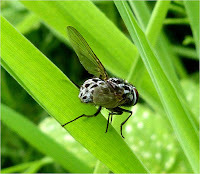 So many creatures, including insects, have evolved so as to look like something else or another creature, that this does not really seem to be beyond the realms of possibility. 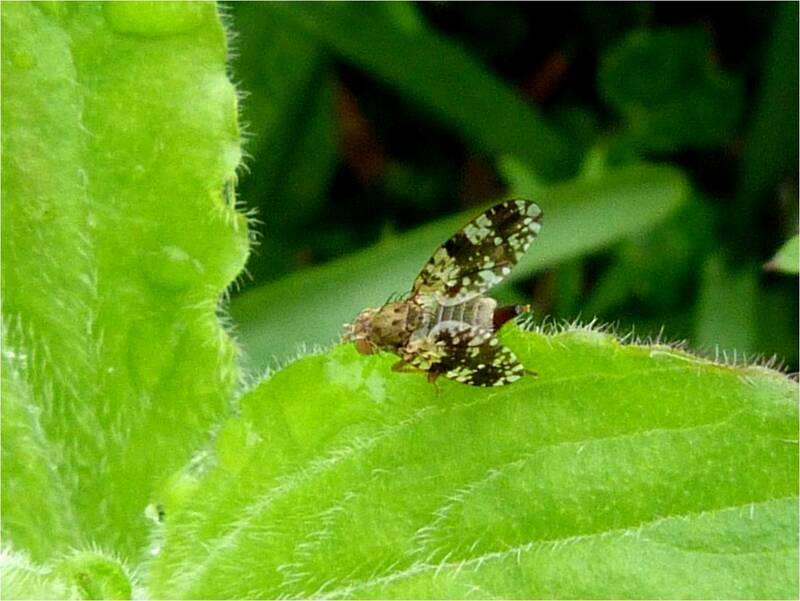 For example, some butterflies are almost indistinguishable from leaves and there's a weevil that looks like a bird dropping. 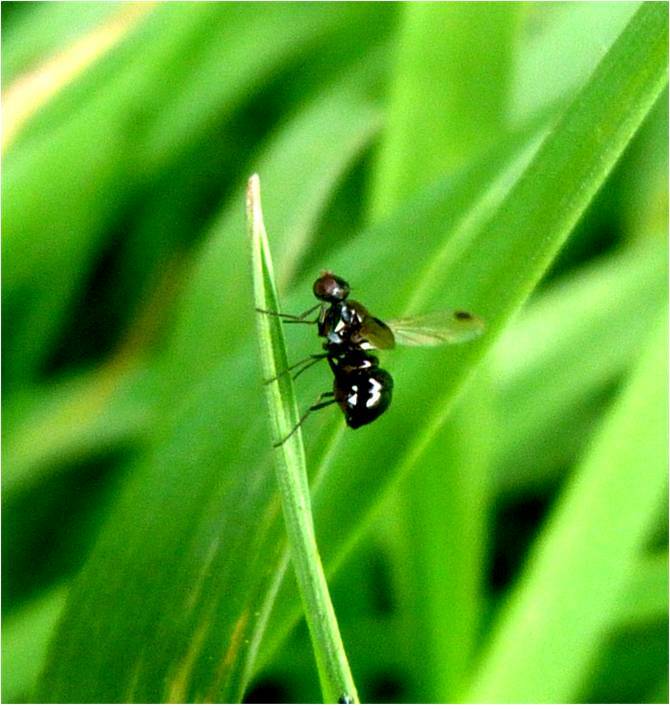 Although the markings on the wings of the fruit fly above, do not clearly resemble ants, they would not need much modification before they did so. 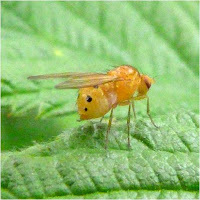 Here is a link to an article that includes photos and other articles about the Goniurellia tridens fruit fly which seems to show fairly convincingly that a fruit fly really has evolved to have pictures of ants on its wings. 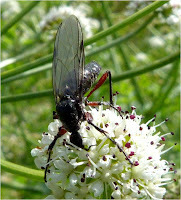 http://whyevolutionistrue.wordpress.com/2013/11/05/fly-with-ant-mimic-wings/. I only got one shot at photographing the one in the middleand I stuffed it up, didn’t I? 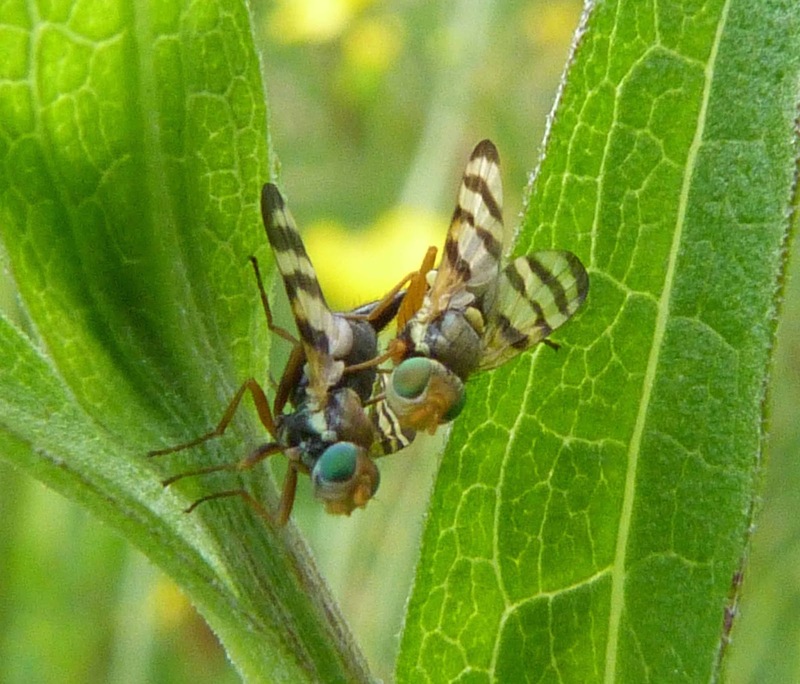 However, the two photos clearly show the difference between the male and the female, with the female displaying the fairly prominent ovipositor in this species. Its wings display this very unusual white and brown irregular striped pattern. 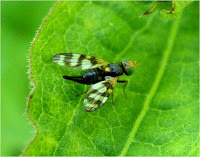 The thorax is brown and the abdomen is green and both have black spots. 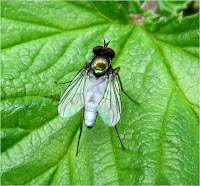 The eyes are an iridescent greeny- brown. 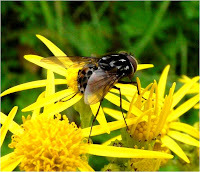 It's a fairly large fly as picture wing flies go. 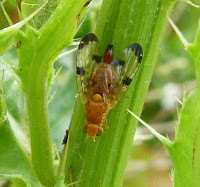 These are often found on thistles and are orange in colour with distinctive dark markings on its wings, particularly on its tips and half way up its wings. This is a female as her ovipositor (egg laying tube) can clearly be seen at her rear. 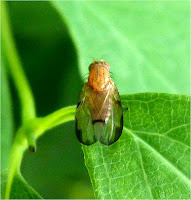 This fruit fly like most (all?) has these amazing iridescent eyes. Always quite hard to get a decent photo of these as they move about so much and hide amonst the thistle leaves and thorns. 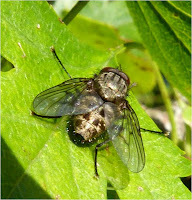 This is clearly a picture wing fly, but I can’t see whether it has the female’s pointed and rigid ovipositor or the male’s blunt and rounded end to its abdomen. The larva cause galls (abnormal plant growths) to develop on the host plant. This picture wing fly has black wings with random translucent markings, yellow legs and (you’ll have to take my word for it) a yellow head. Males try to attract females by waving one of their wings in the air. 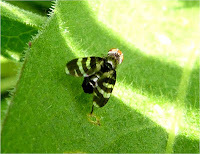 Quadrifasciata means four barred and is so named due to the four ‘stripes’ on each wing. 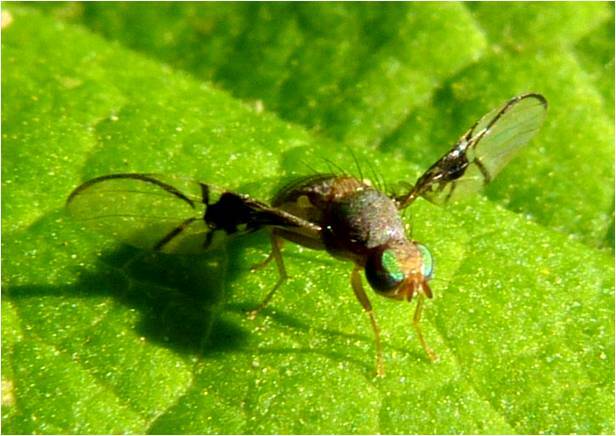 They also have large green eyes and a yellow dot at the base of its thorax. The ovipositor of the female can clearly be seen here. 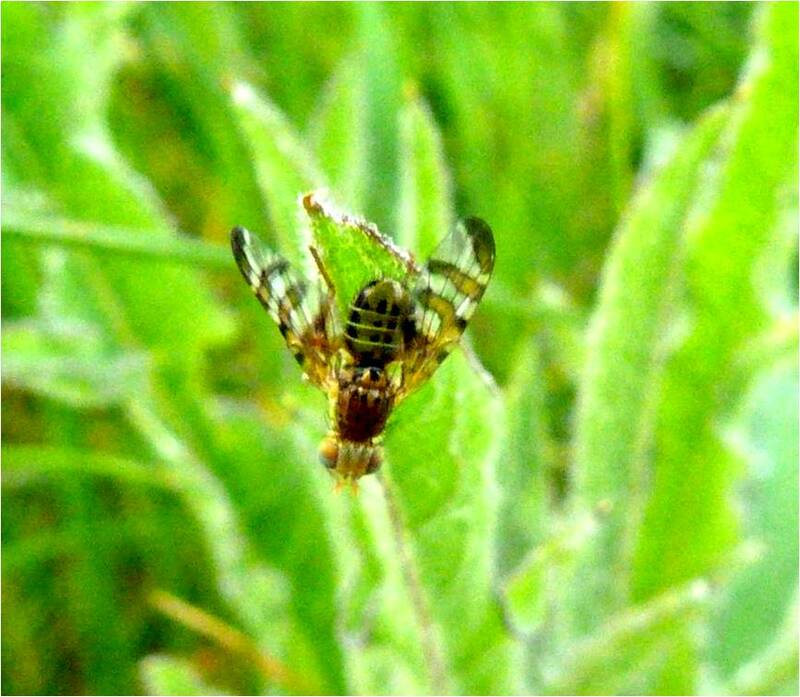 The female lays eggs on knapweed flower buds which form galls. 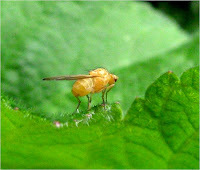 A tiny female fruit fly, around 5mm long, with a long and protruding ovipositor. This fruit fly looks (to me at least) incredibly like the fly above, Urophora quadrifasciata, however, in this species, the dark markings seem less pronounced and there are fewer of them, with the markings only reaching about half way up the wing. 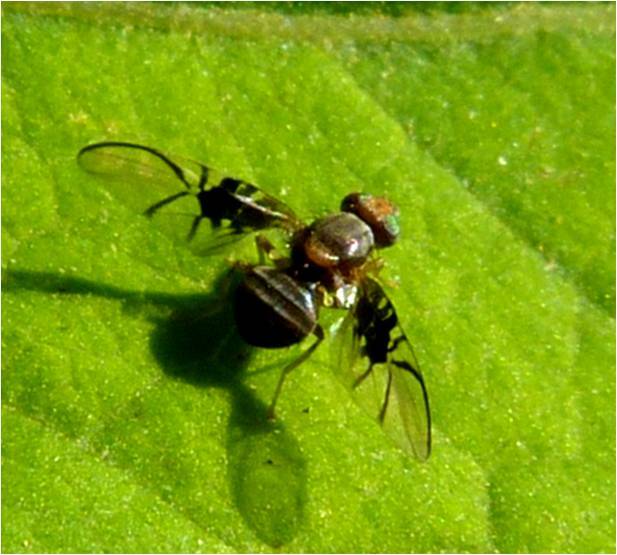 These fruit flies do, however, similarly have the large green iridescent eyes (although they can be a mixture of green and orange) and a yellow scutellum (the triangular part most easily seen in the top photo). 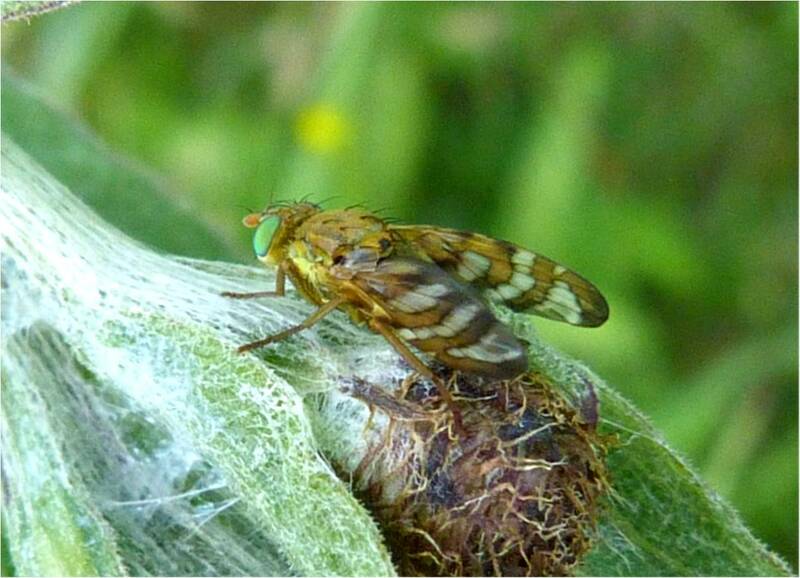 They lay their eggs in thistles and are gall causing. 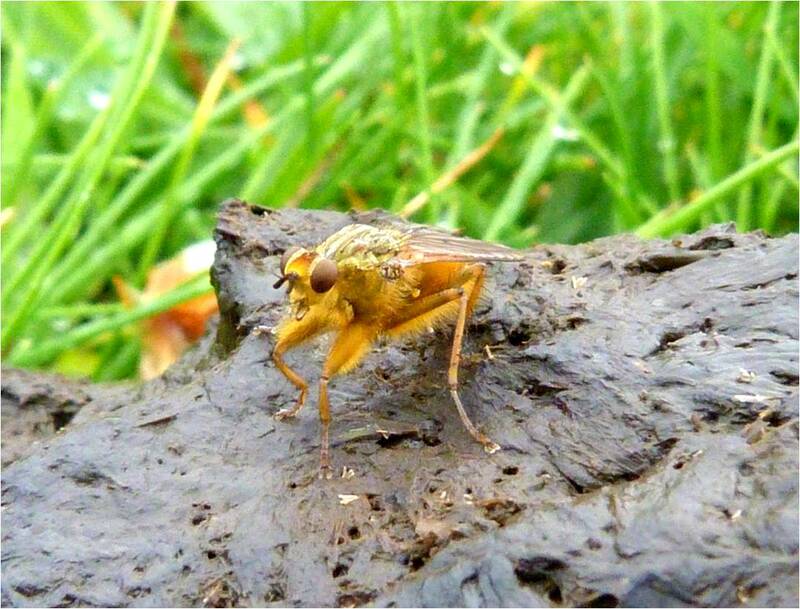 Whilst this species of fruit fly is relatively common in the south of England, it is much rarer here in Scotland. I don't know if the unusually hot summer we're having this year has anything to do with that. 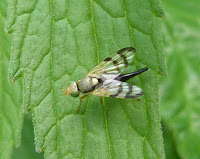 Thanks once again to https://www.ispotnature.org for their help in identifying this and so quickly. 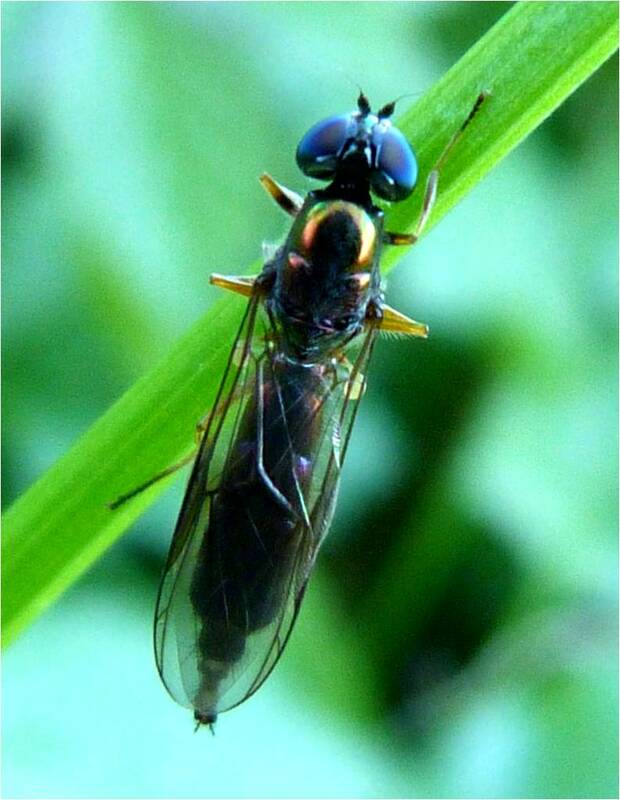 There's a clue in its Latin name, 'tripunctata', i.e. three spotted. As you can see, each wing has three distinct smudges. 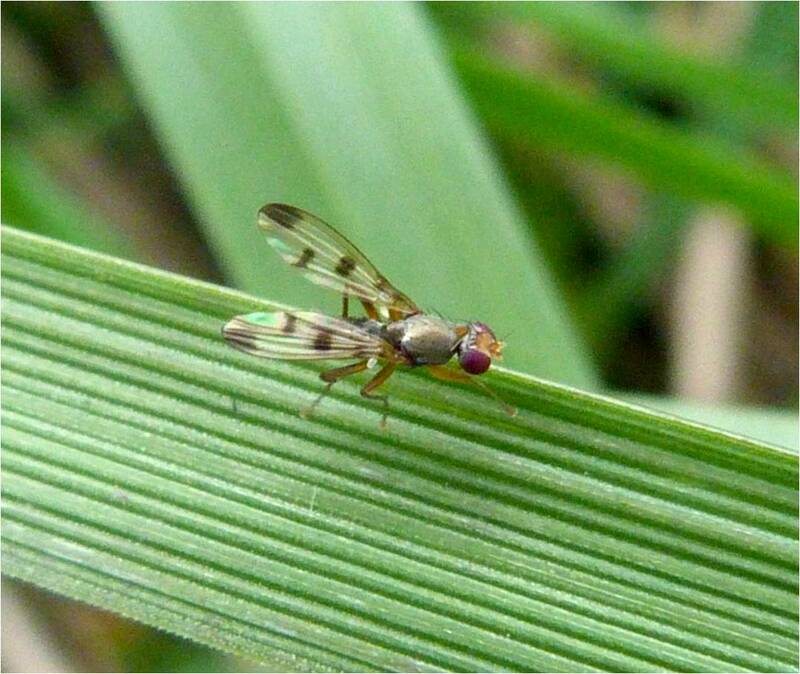 This wee beauty was seen marching up and down this piece of grass, stopping intermittently to wave its wings, presumably trying to attract a female. 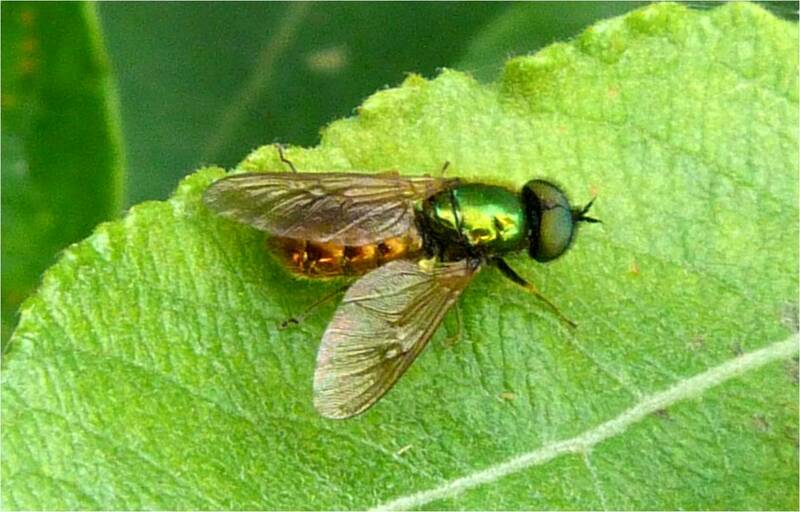 It has large red compound, green metallic thorax and black abdomen. 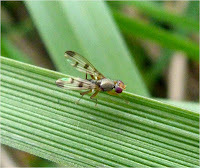 Its larvae drill into grass roots and it can be a pest in cereal crops. The thorax is striped whilst the abdomen is chequered black, white and grey. As you can see, it's eyes are large and bright red and it has quite a spiky looking 'bottom'. The authorities I've read call this a 'medium-sized' fly, but this one was huge - definitely one of the largest flies I've ever come across. They are attracted to carrion and dung, where this one was found - and therefore was less than appealing and rather whiffy to photograph! Flesh-flies are 'viviparous' which means they lay live larvae instead of eggs. Not generally well liked by most people for some reason, though even I’m not sure I’d like it landing on my picnic food. Dissection would be required to identify this precisely. 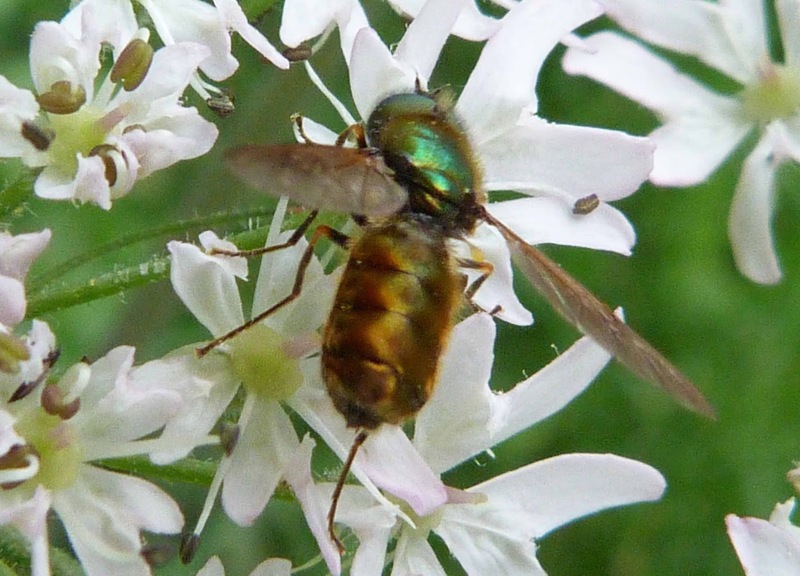 One of the best known insects – the greenbottle, although they would in fact need dissected to identify them properly. Despite it being so abundant, it’s well nigh impossible to get a good photo of it, as it seems to be very camera shy and its shiny body creates terrible lighting problems. 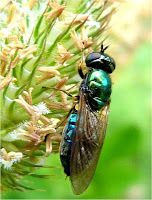 Greenbottles, which can be bluish or bronze (see photo on the right and below) are far more attractive in my view than their bluebottle cousin which tend to be larger and duller than the bright metallic greenbottles. 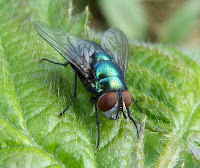 One of those insects everyone knows – the common bluebottle - it can often be confused with greenbottles. Bluebottles have a distinctive black/dark hairy thorax and not a shiny bright thorax as can be seen in the photos above. 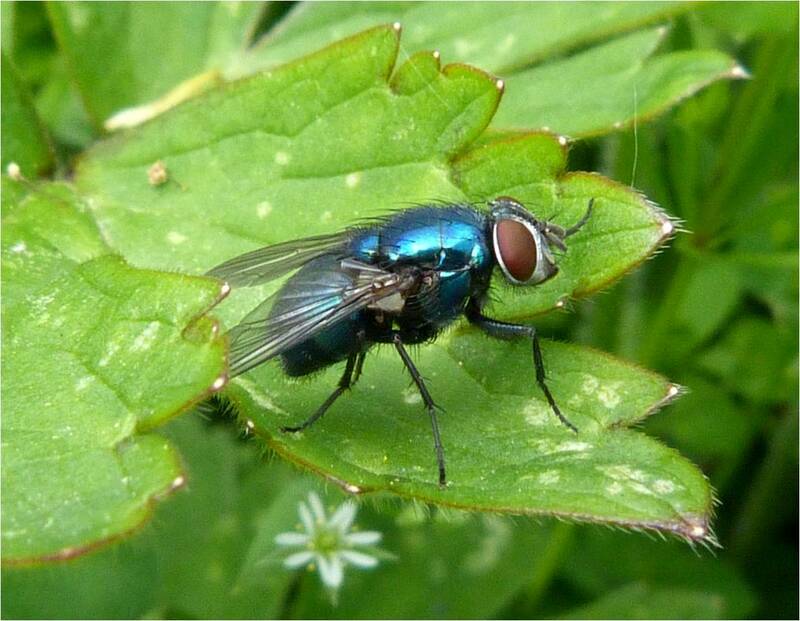 Bluebottles and their larvae like eating carrion. A very common insect often found on horse and cow dung. The male (left photo) is a golden yellow colour and furry whilst the female (on the right) is greener and less furry. 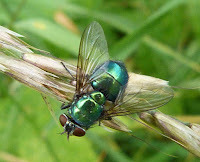 It’s said that these flies are filthy and they are, but despite this they are rather attractive insects. 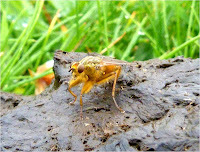 Whilst plenty of insects live, eat and breath dung, there come times when even they succumb to dung-related illnesses. 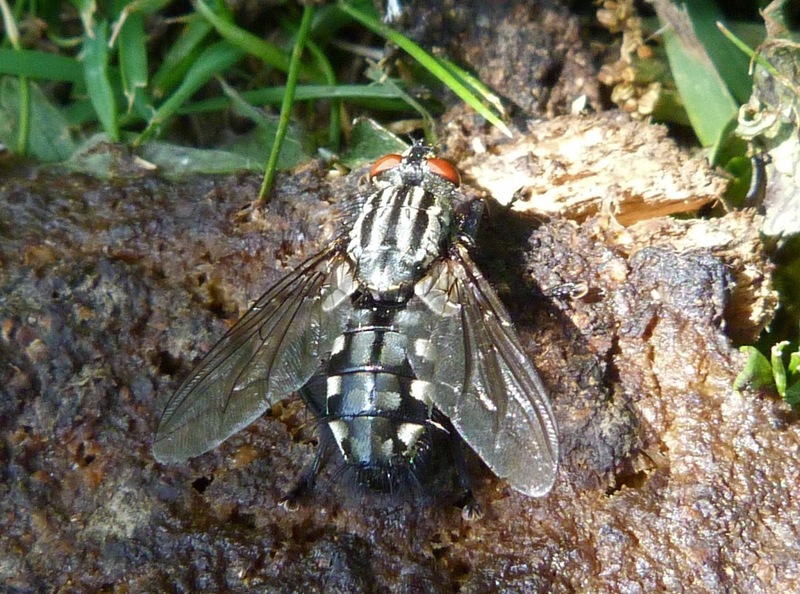 Flies that live around dung are particularly susceptible to a disease known as entomophaga which causes a fungus to grow between the insects body segments. 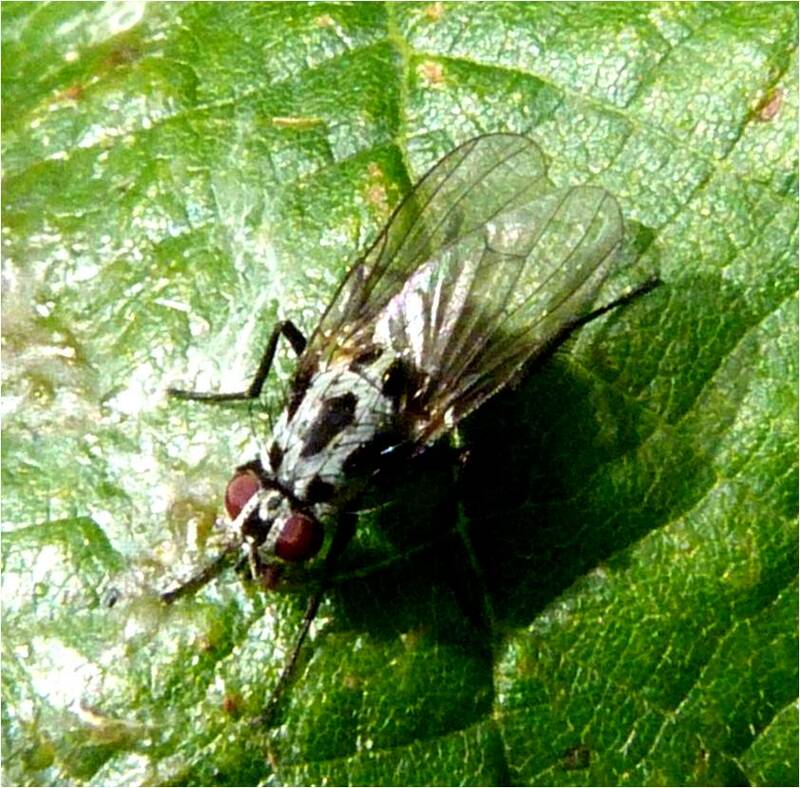 Somehow, once the insect is almost entirely covered by the fungus, the fly climbs on top of a plant where it dies in conditions that are ideal for the fungus to release its spores. 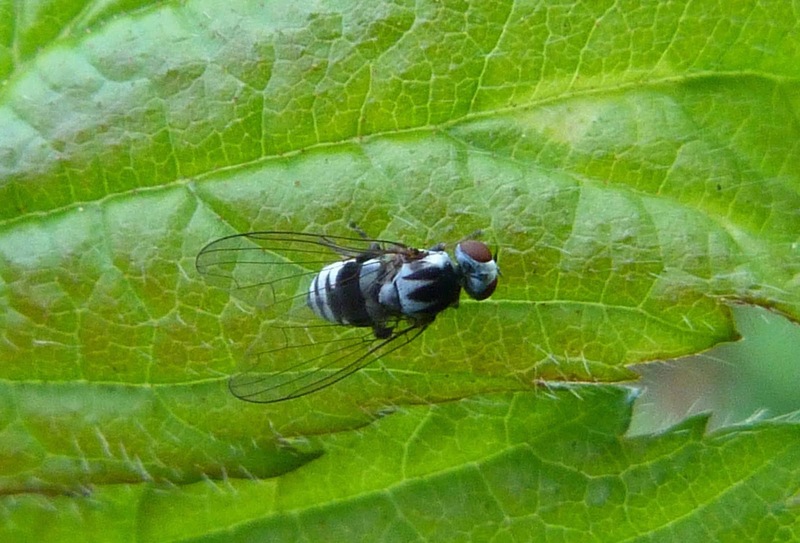 A truly beautiful and delicately patterned little fly. 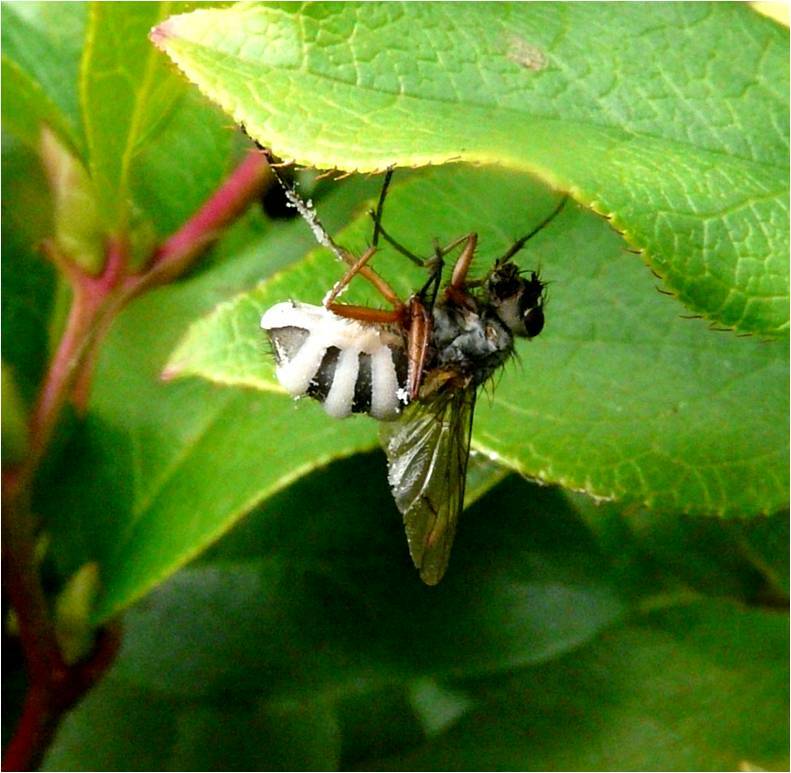 Both males and females have a black and white striped thorax, but males have the orange spotted abdomen, as in the top photo, whereas the female’s abdomen is spotted grey and black, as in the photos on the bottom. 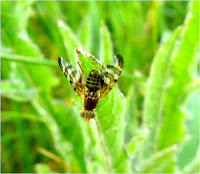 Males wings are tinted yellow all over, females are only tinted yellow near the base. 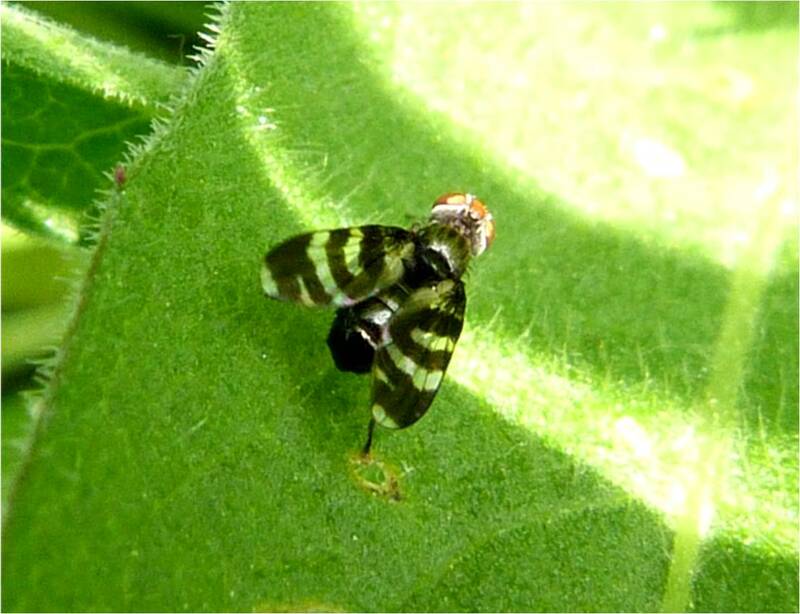 Also know as the snail-killing fly because their larvae parasitize snails. The thorax is striped and the abdomen and wings are orangey-brown. The wings have dark spots on them. The eyes are bulging and each has a double stripe resembling a positive pregnancy test (although you have to look pretty closely to see it here). 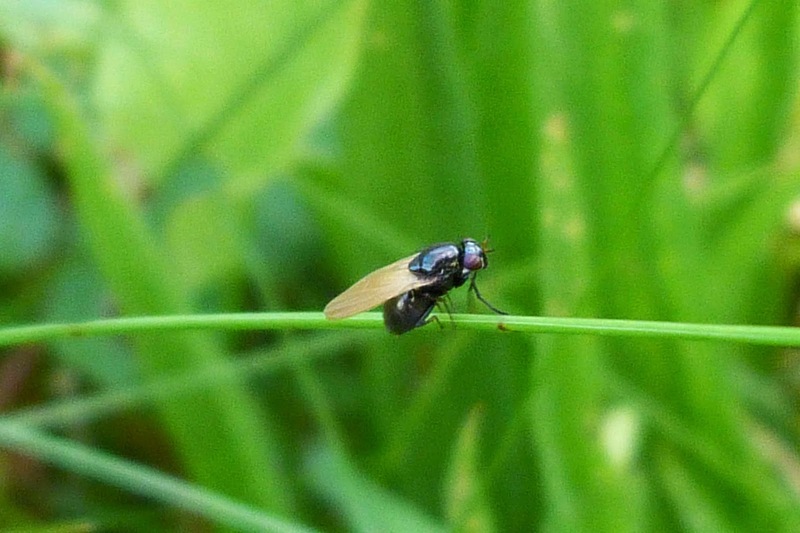 Is this just another Marsh Fly (Ilione albiseta) like the last photo? 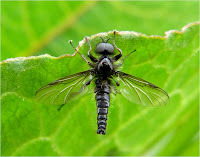 The pattern on the wing looks very similar, but the thorax is yellow with brown stripes rather than grey with black stripes and the head has a large yellow expanse between its eyes. Still, it somehow has that ‘snail-killer’ look about it. Whatever it is, it certainly was curious, staring up at me for ages. 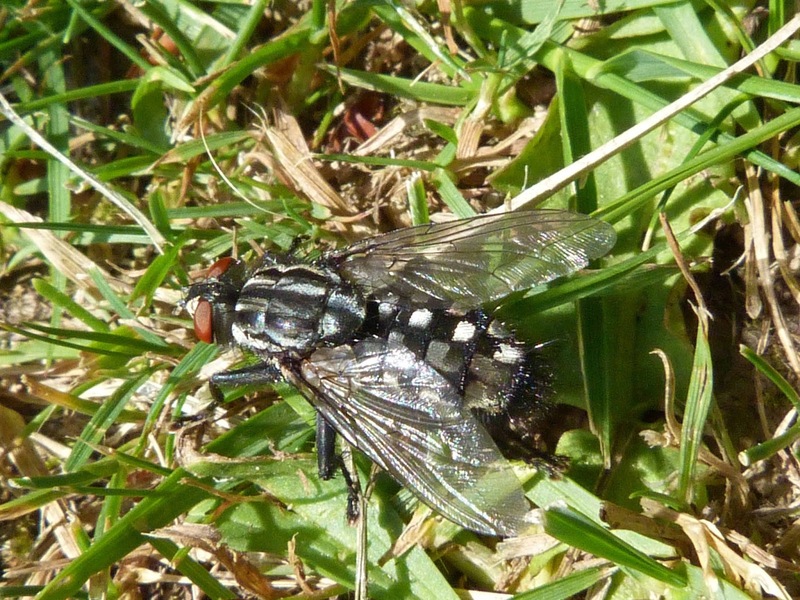 A very attractive and eye-catching fly, with the thorax in distinctive contracting grey and black and large red eyes. The males eyes almost touch. 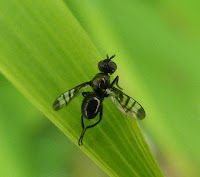 These flies notoriously difficult to identify with any certainty are and there are some other very similar species such as Anthomyia imbrida and Anthomyia procellaris, but they have a black spot at the base of their wings. 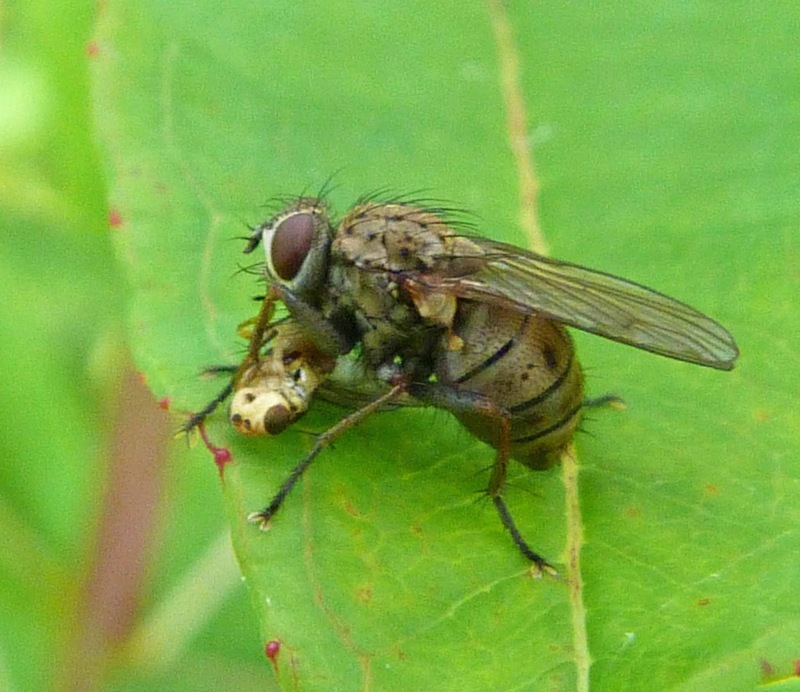 Bird droppings seem to be the food of choice for this fly. 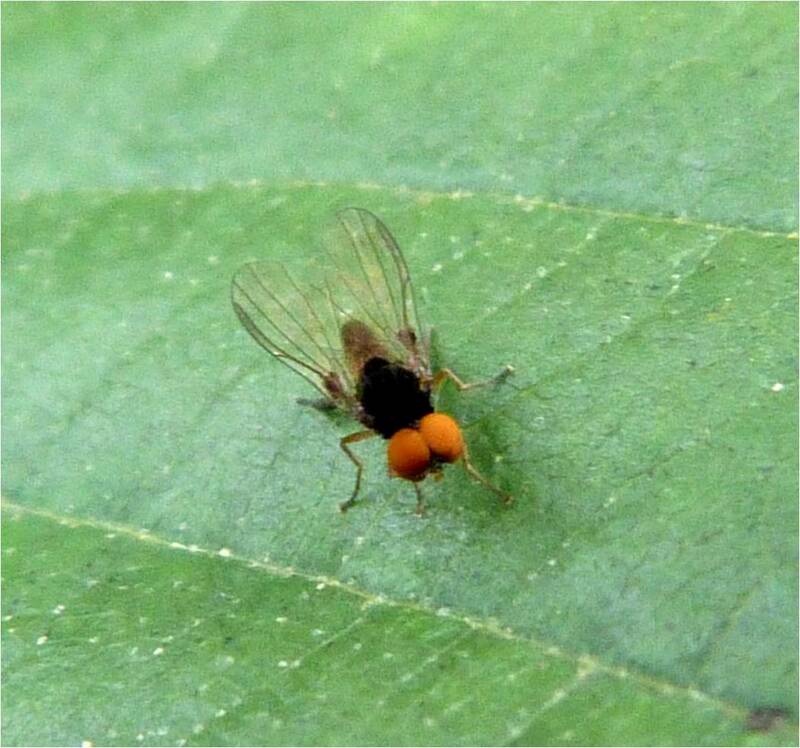 With its large red eyes, and striking orange abdomen, this little fly really stood out against the leaf. They also have mostly orange legs as can be seen clearly in the middle right photo. 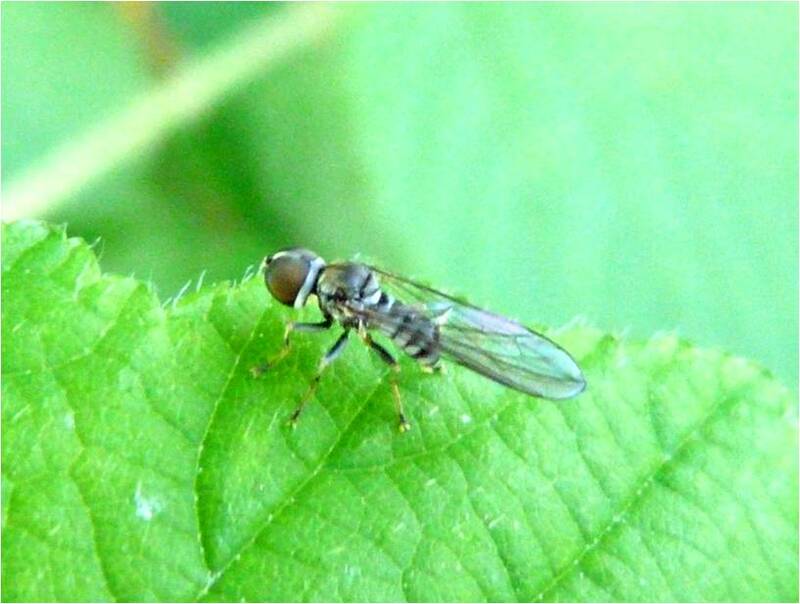 I was hoping to be able to work out what species this might be, but http://www.ispotnature.org stated that a specimen would need to be examined to ID it. They did, however, confirm that it is not Pegomya bicolor (which I thought it might be) which, unlike this one, has a space between its eyes. 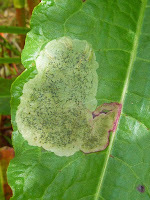 Pegomya larvae mine Dock leaves like the one in the bottom photo. Without expert examination and knowledge, this fly is indistinguishable from Helina annosa. 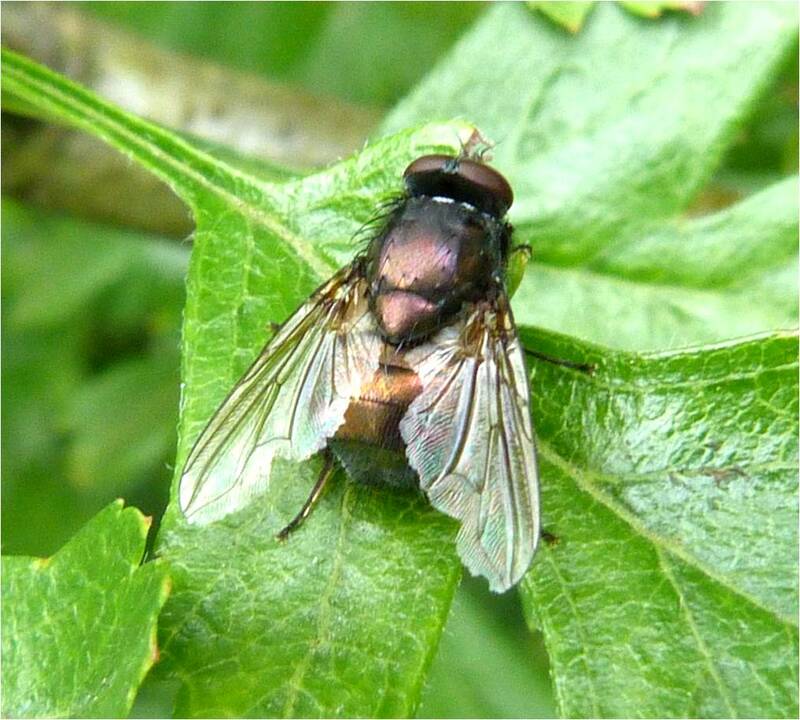 It's unusual black marking on its abdomen and striped thorax, however, make it fairly recognisable as one of the two. 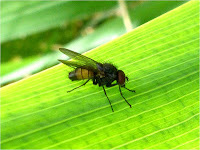 Its wings also have these noticeable dark veins running along them. The males and females are very similar, with the only distinguishing feature being the touching eyes of the male (as here) and the females' separated eyes. After all this time, I've just discovered that the posh name for the touching or close eyes of males is 'holistic'. 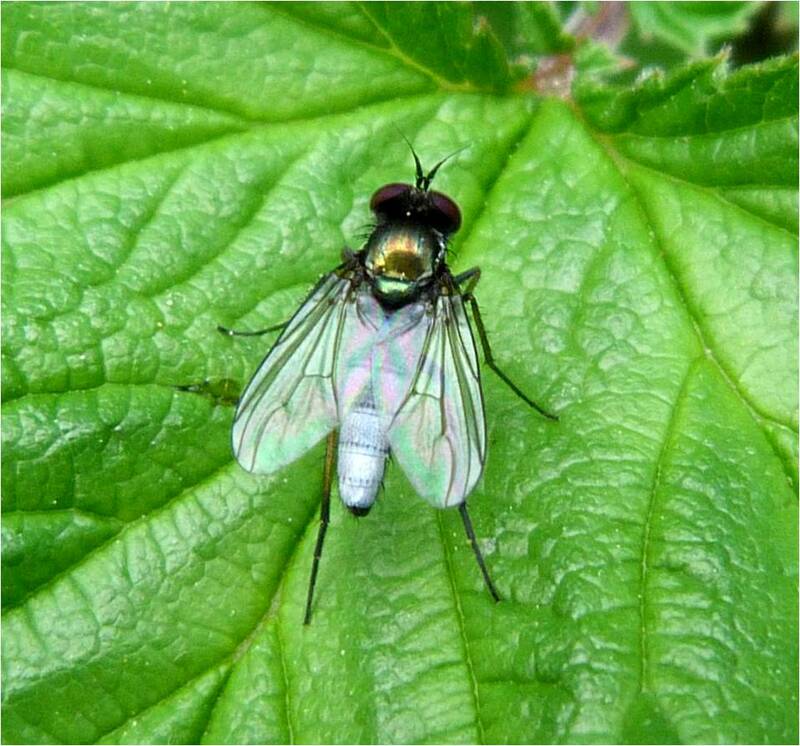 This stunning fly was found sunning itself close to a stream. It has, however, been tortuous trying to identify it, and I'm still not sure I have identified it correctly, so all thoughts are welcome. It has a green metallic thorax, a very striking greyish-white long tapering abdomen and large dark reddish-brown eyes. Unfortunately, I cannot find any information about this fly so if anyone knows anything about it I would be delighted to hear about it and I will update this page. I wasn't sure what this fly was at first as it sat sunning itself 'dragonfly-like', but its hunched thorax gave its identity away. You can tell this is a male St Mark's fly due to its large bulbous eyes, unlike a females eyes which are noticeably smaller - see the photos below. 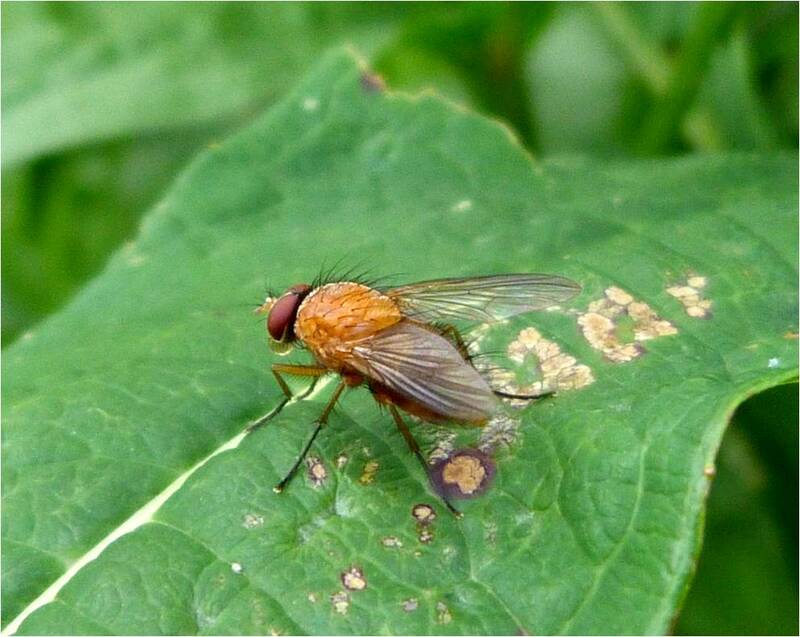 This species can also be distinguised from others by its reddish legs. 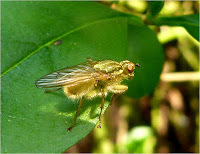 These are known as St Mark’s flies as they are seen around St Mark’s day (April 25th). 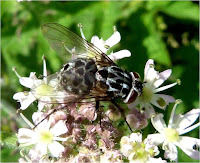 It is also known as the March fly - but this is its American name, so it is best to call it the St Mark's fly here in the UK. The heads of the female and male are quite different with the male (facing downwards in the right hand photo) having large hairy compound eyes that meet on the top of the head and the female (facing upwards) having a small narrow head whose eyes do not meet. 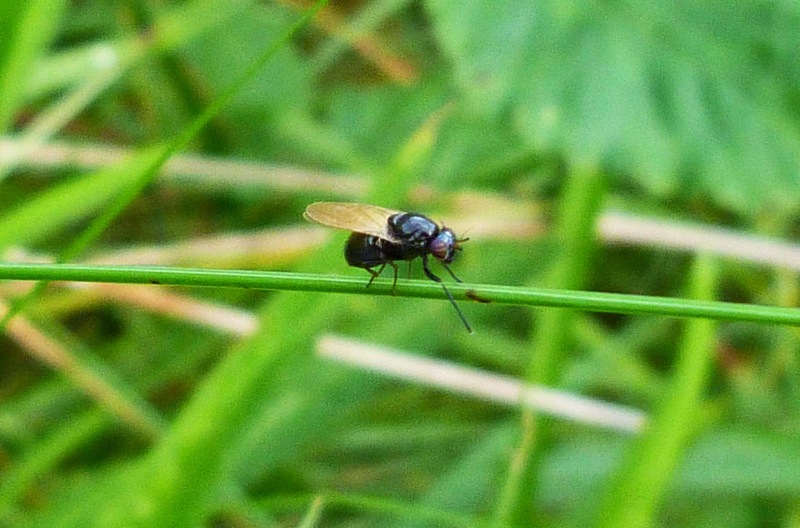 I can usually identify these flies due to their Hunchback of Notre Dame appearance. 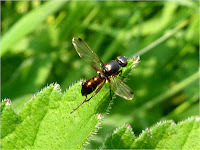 The photo on the right shows the flies mating and the male facing downwards demonstrates what often deceptively appears to be earwig-like pincers which are in fact simply the margins of the wings. 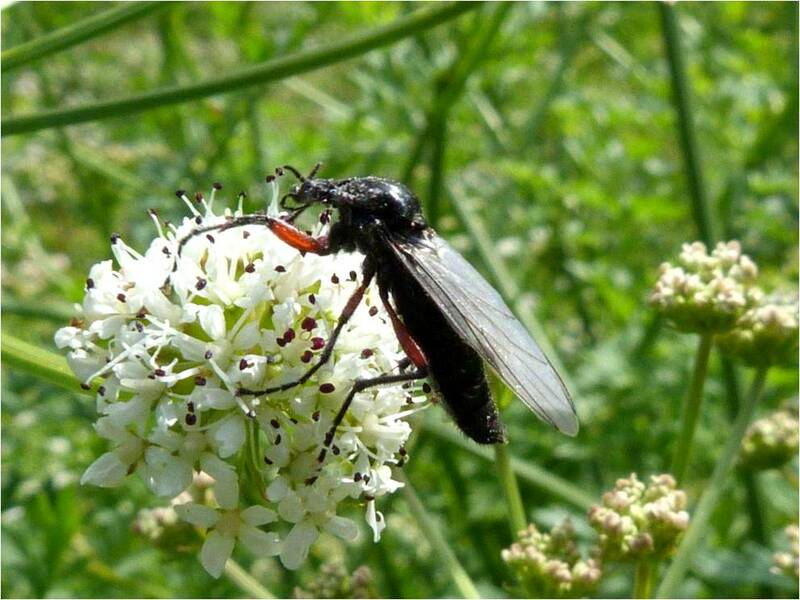 A large and impressive looking insect with a lovely shiny thorax. 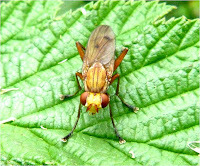 Again, the head of the St Mark's fly in the top photos is small and is therefore a female. The male in the bottom photo looks just the same, but with large eyes, making the head look much bigger. 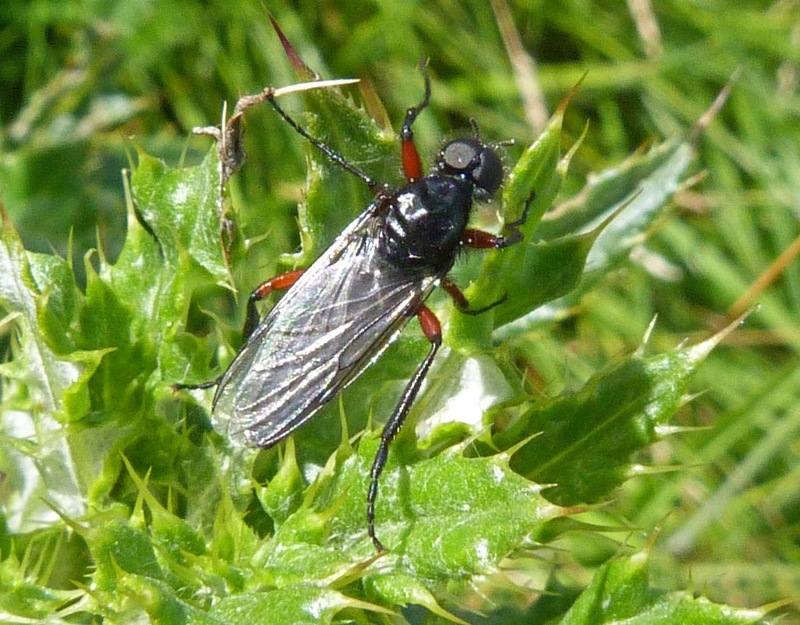 This species of St Mark's fly is readily identifiable by its red thighs. Let's be honest. If you discovered this fly would you call it 'flat footed fly', it's not exactly its most prominent feature is it? 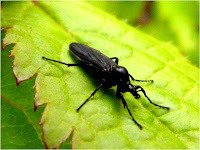 No - you'd call it 'tiny black fly with massive red-eyes and a hump' - or something along those lines. 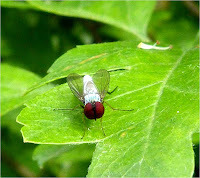 Anyway, this fly was tiny but its bright red eyes made it really striking. 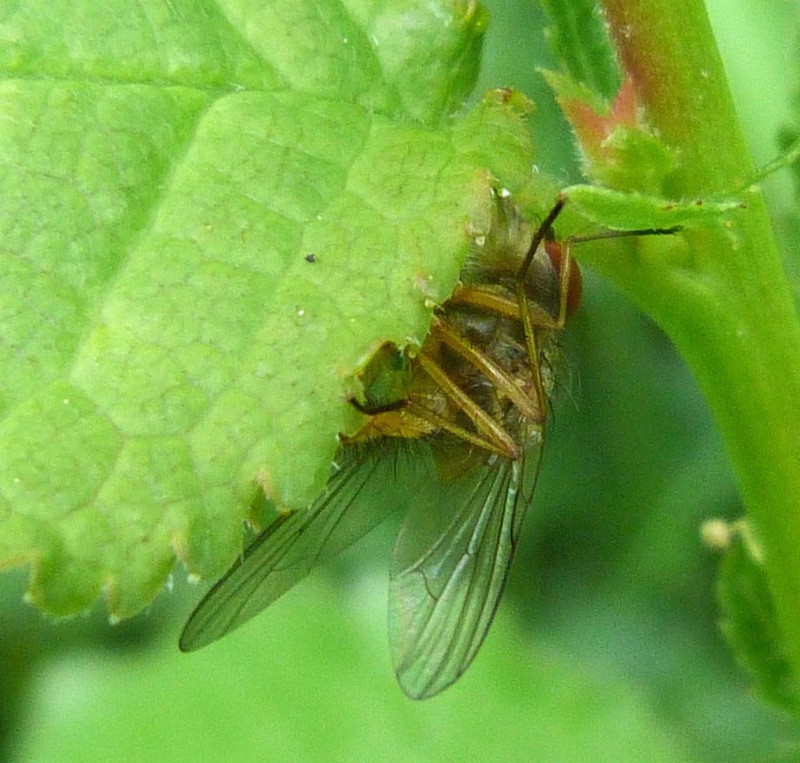 It was also discovered fairly late in September, when there were few other insects around. 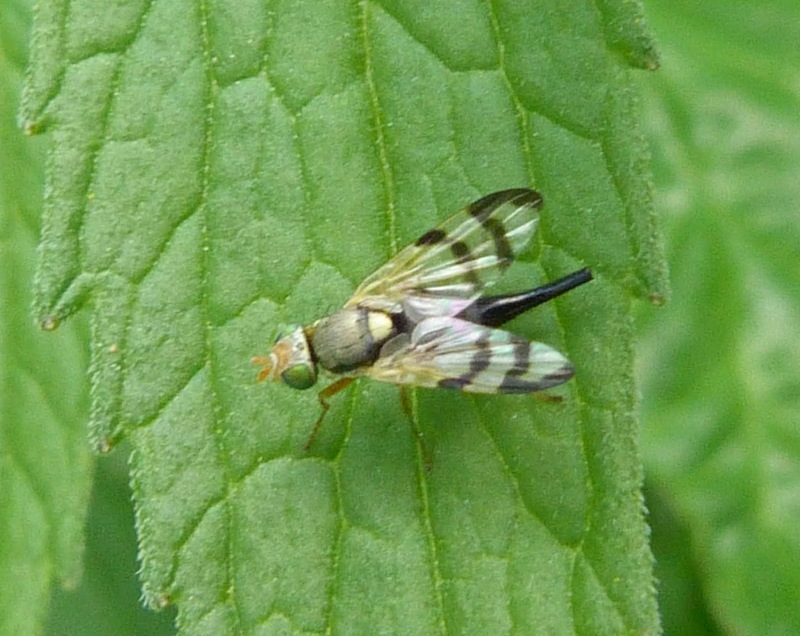 I thought it might be a snipe fly because of its downward sloping abdomen, but it doesn't appear to be one. Again, I cannot be certain of the exact species. 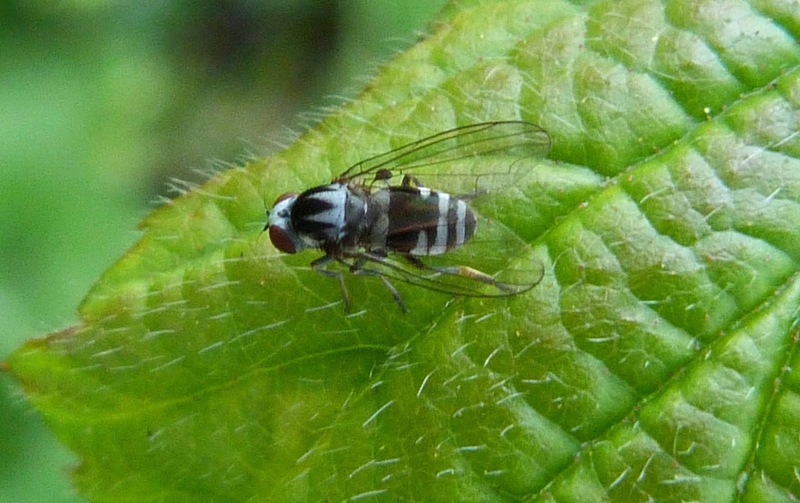 The abdomen of this species often has black and silver stripes, but can be variable. It also appears to be more commonly found in England rather than up north in Scotland. 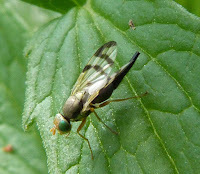 A tiny shiny black fly, which probably wouldn't have caught my attention had it not been for its strange yellowy wings. 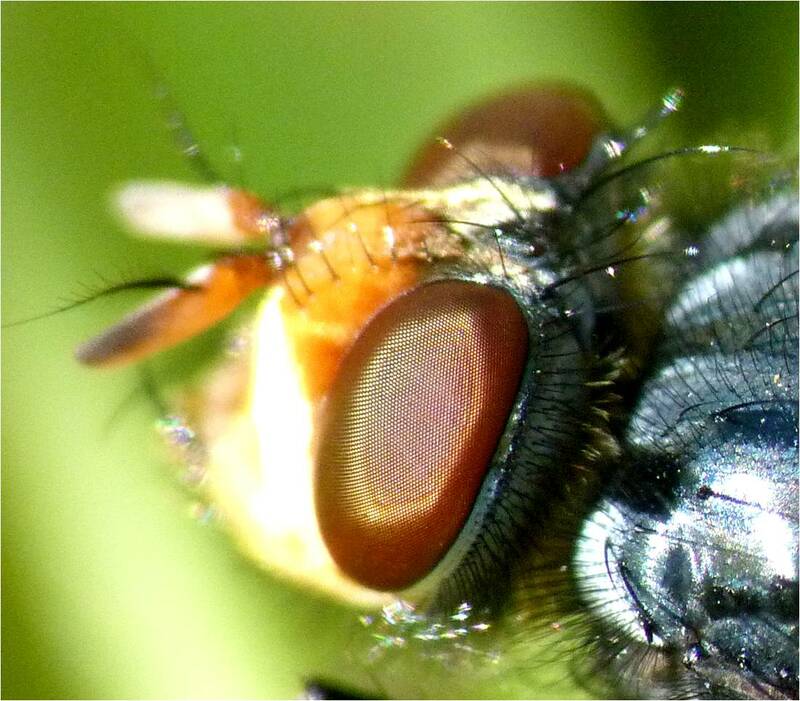 Also, on expanding the photograph, you can see that this fly has two iridescent bands across its eyes. Unfortunately, it didn't hang about long enough for me to get a better photo of it than this. It is also pretty difficult to identity as there are many species that look similar to this. From why I can see, it tends to be found in quite localised areas of Scotland, but as you can see, I found this one on the isle of Mull which makes it sound more exotic than it probably is. 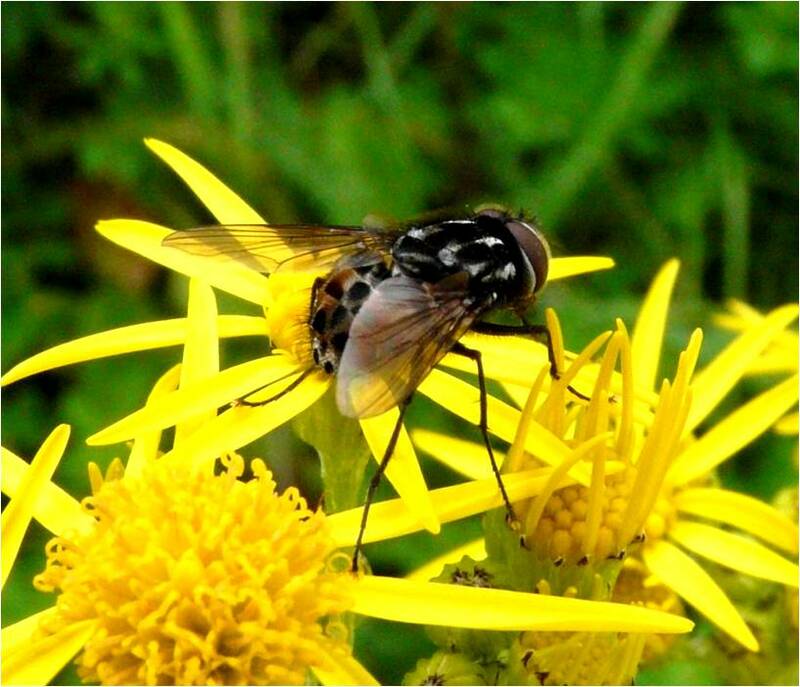 Small but mighty - this tiny but beautiful bright yellow fly with a pinkish 'face', with what looks like golden stripes on its abdomen and dark stripes on its thorax is a sight to behold. 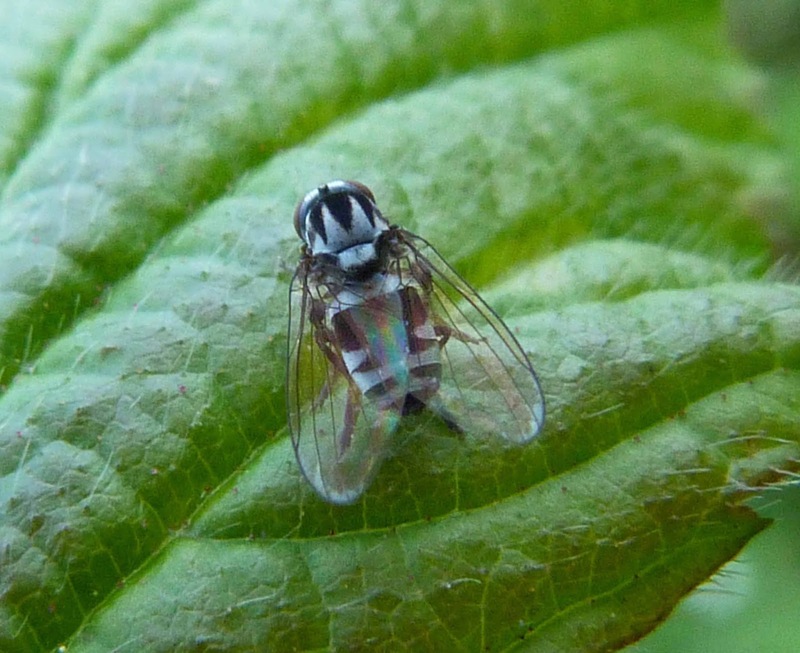 It is only 2 or 3mm long, but really stands out due to its striking colouring. 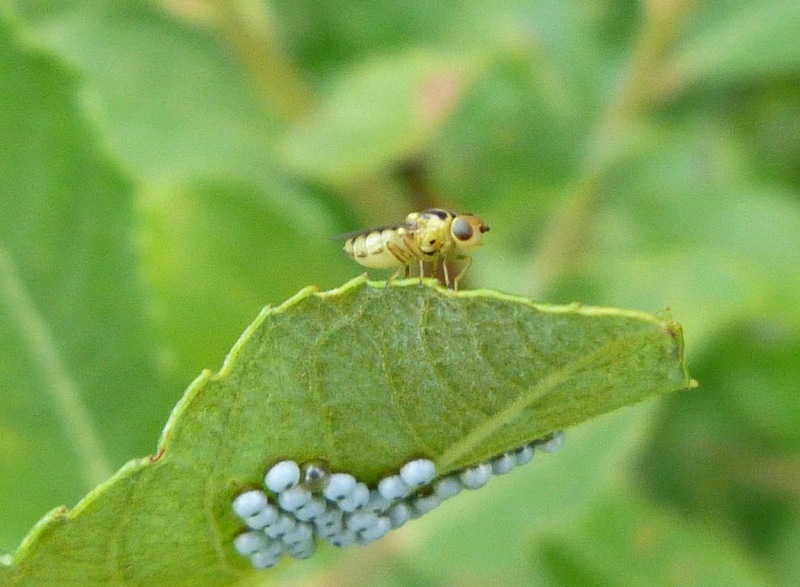 By coincidence, the underside of this leaf has moth eggs on it, but these have no connection to the tiny fly. 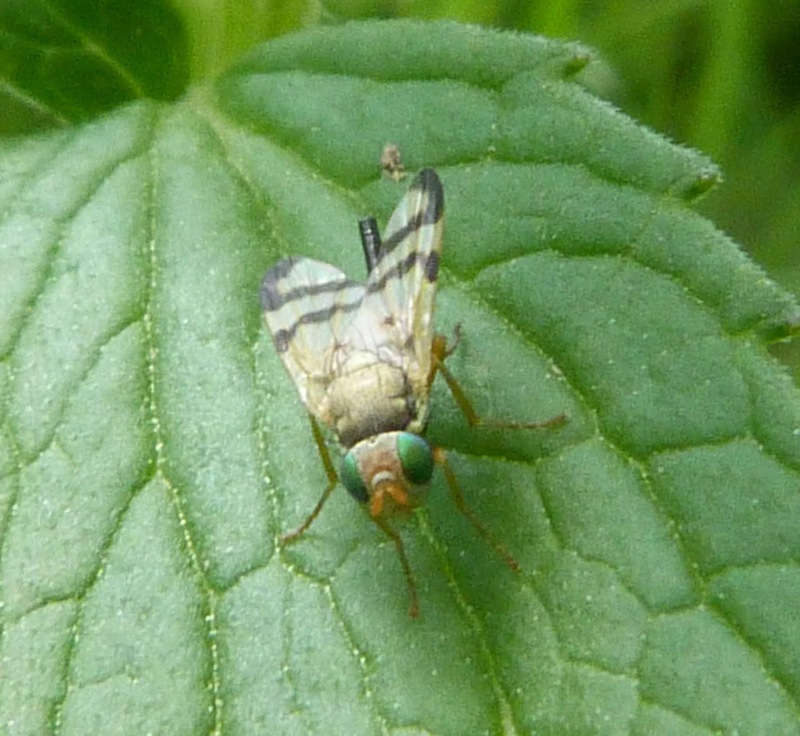 There are a number of similar looking species, so I can't be certain of the identity of this one. 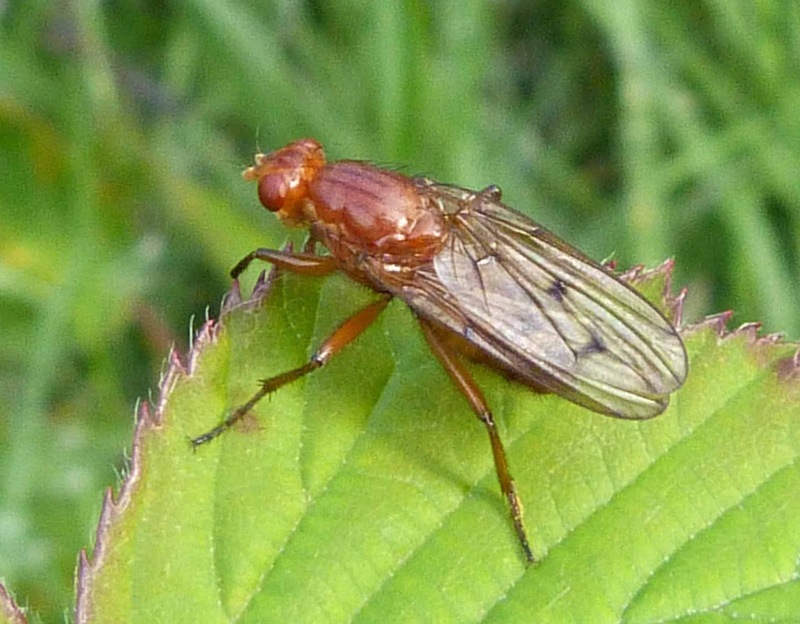 It took me ages to get any possible identification for it at all - and particularly annoyingly, I found it on a Rentokil website! Not pleased - why would anyone want to do this wee creature any harm? An orange fly with a very hairy thorax and abdomen. Muscid fly, just meaning house fly, although I’ve thankfully never seen one of these in my house. It’s larvae grow in fungi and under tree bark. As is typical with many flies, the male muscid’s fly’s eyes meet in the middle and the female’s eyes are separate. 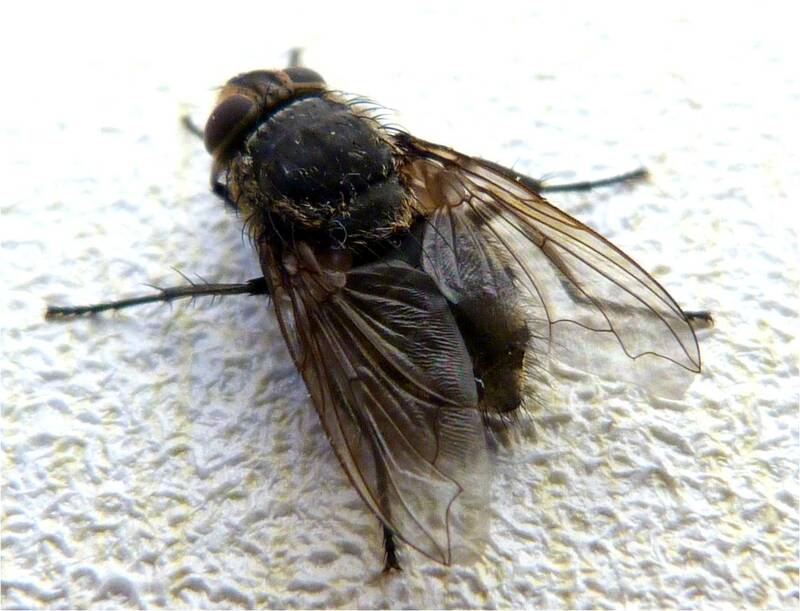 Although the bottom two photos were taken using a macro lens, they are genuinely quite large and imposing flies. 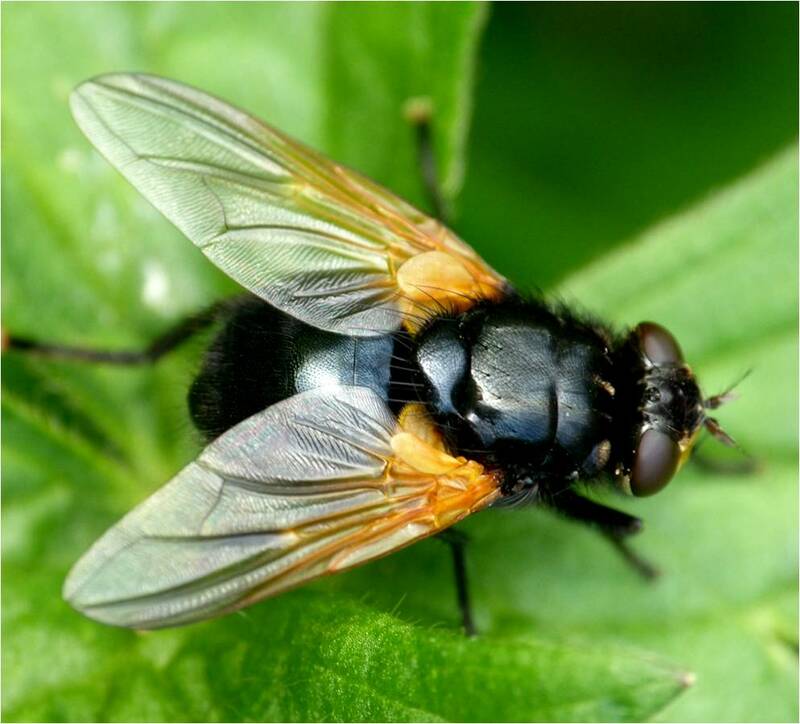 This species is also fairly recognisable being a shiny jet black colour with highly contrasting orangey-gold face, feet and wing bases. It likes wooded, cattle-rearing areas (which is exactly where I found these ones) and breeds in dung. It is often known as the noon fly and especially likes basking in the sun on tree trunks, as can be demonstrated in the photo on the right. According to Wikipedia, the female of this species lays up to 5 eggs in a lifetime, each one in a different cow pat at 2 day intervals. Now, I have no way of knowing whether this is true or not, but it does sound like it 's been someone's job to sit around for days on end watching noon flies go about their business and counting the number of eggs they lay in which cow pat. Why can't I have a job like that? So there I was, photographing these two flies mating thinking, these are slightly dull, nothing much of interest going on here, when I turned away and by the time I had turned back, this... Now, I'm not absolutely sure that the fly she's eating is the one she's just been mating with, but if not, she must have managed to get rid of the male and catch a female pretty darn quickly. 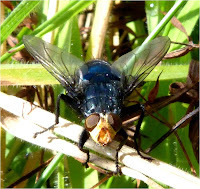 I don't know, the 'face' of the fly being eating looks more yellow than the original male. The one distinguishing feature of these flies is the dark spot on their abdomen. Anyway, anyone know of cannibalism among flies? Has that happened here - or not? Quite a peculiar looking black hairy fly with red eyes, long legs and a conspicuous creamy-orange abdomen with narrow black rings. 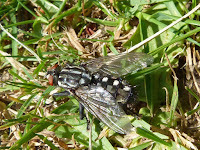 The male has a black tip whereas the female's abdomen is all creamy-orange and seems to be much broader. 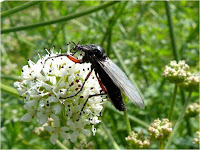 As you can see, the thorax can vary from black to grey, and there are other similar species. Whilst this appears to be a muscid fly, the male in particular looks a bit like a spikey bottomed tachinid to me. This would be a fairly uninteresting orange fly were it not for the fairly eye-catching and disctinctive black markings around the edges of its wings and a short, black 'hyphen' on its wings seemingly in line with the tip of its abdomen when the fly is at rest. 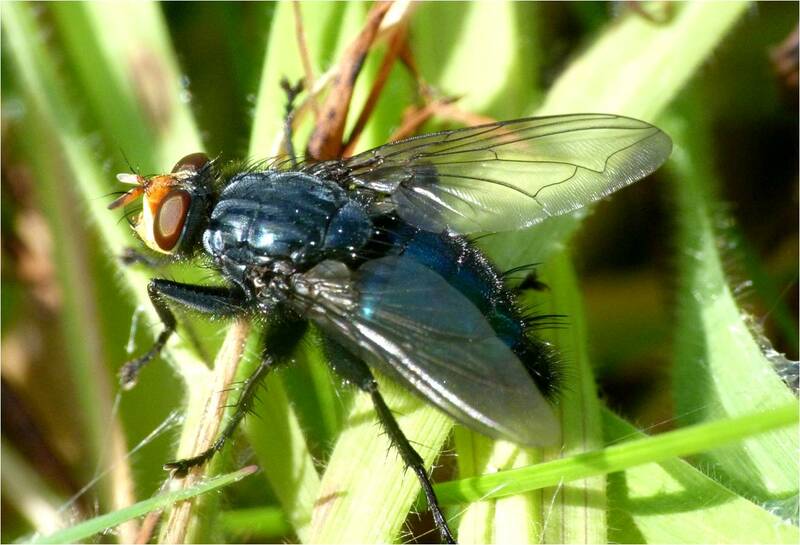 The photo on the right also shows some faintish black rings round its abdomen and a sparsely hairy thorax. Unfortately, I cannot find any interesting facts about this fly, so if you know any, please let me know so that I can include them here. Quite a cute insect this one. 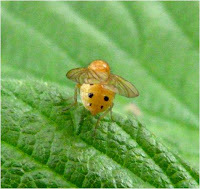 The obvious features are that it’s small and pinky-orange with six black spots neatly arranged in two lines on its abdomen. 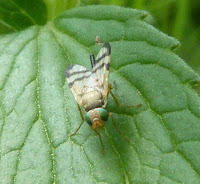 This is presumably how it gets its name ‘sexpunctata’ i.e. six dotted. 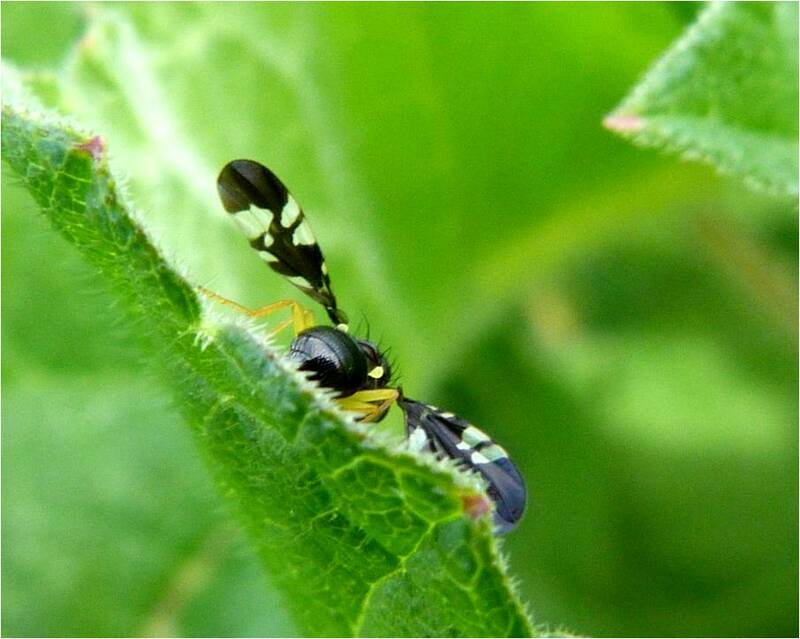 This insect can be distinguished from other similar species by its shiny thorax. 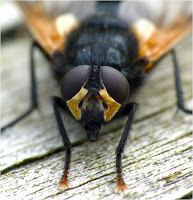 The reddish-brown eyes are bulging and separated. 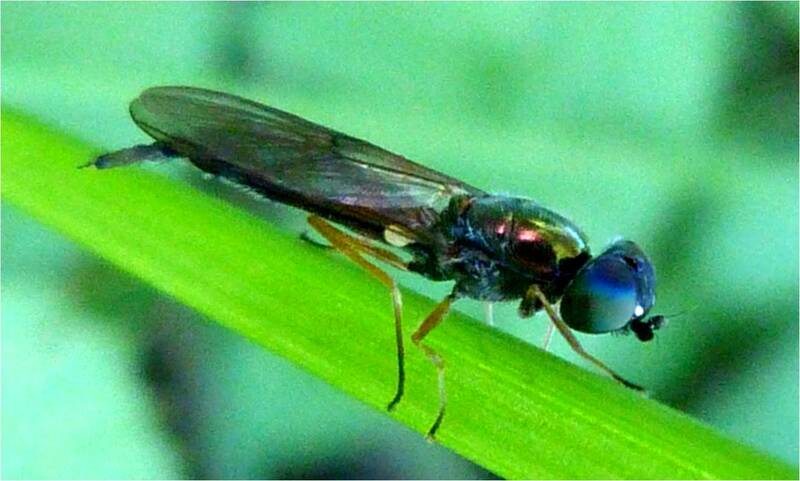 This looks like Sapromyza sexpunctata’s (the previous insect’s) ugly sister. Not so cute without its spots is it? I’m not convinced this is the correct identification at all. 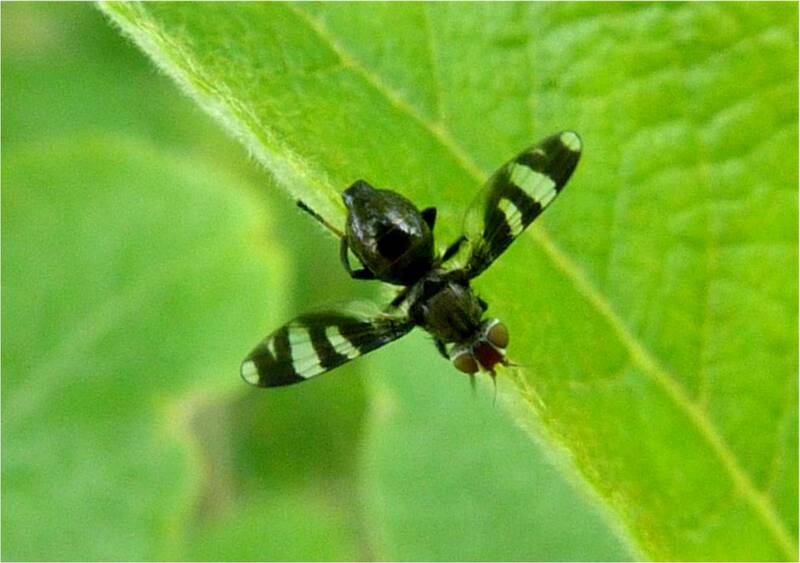 This insect seems to have a broader abdomen than the photos I’ve seen of Actenoptera hilarella. As ever, any idea what this might be will be much appreciated. 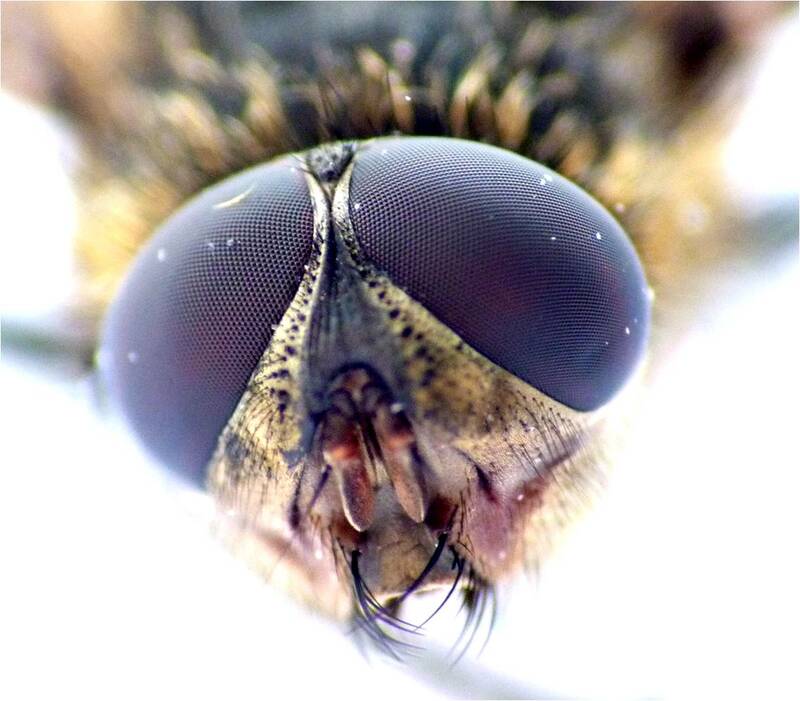 A tiny fly with a huge head. 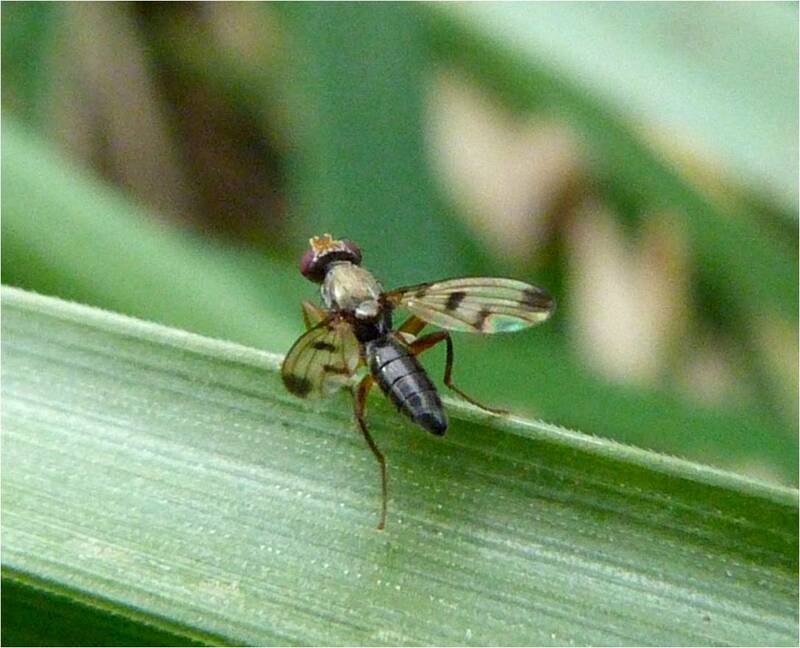 There are a number of similar Picunculidae and it can be difficult to tell them apart and this photo isn't clear enought to determine its identification precisely. 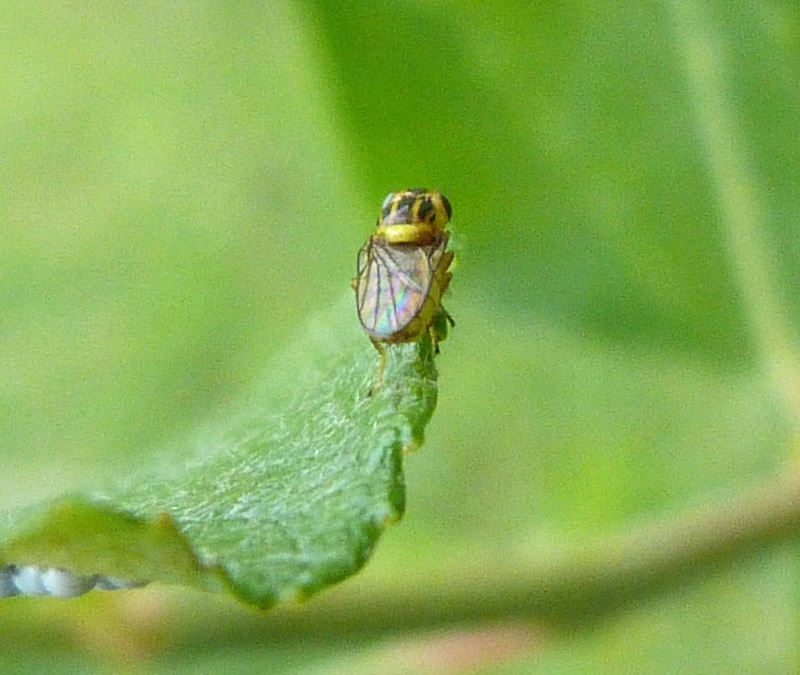 The larvae paratasize leafhoppers and planthoppers and it is thought their enormous eyes help them to spot their hosts. 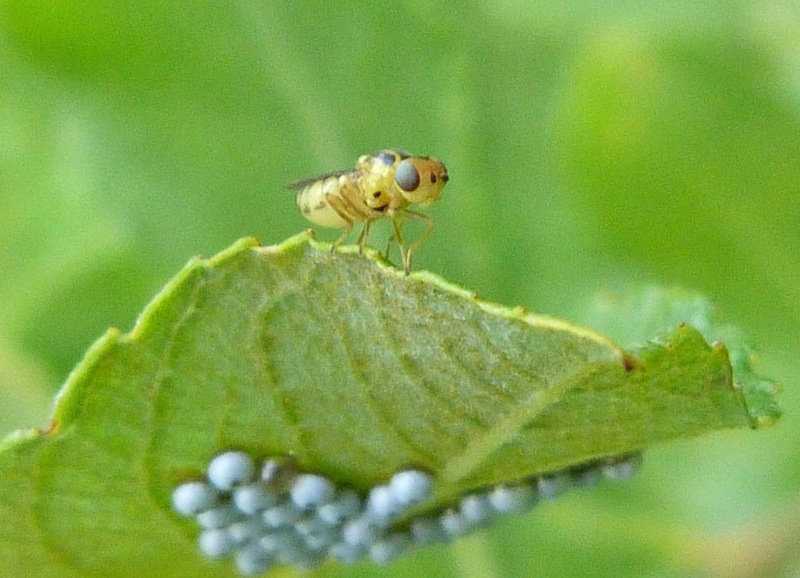 The larvae eat the hosts entire body. 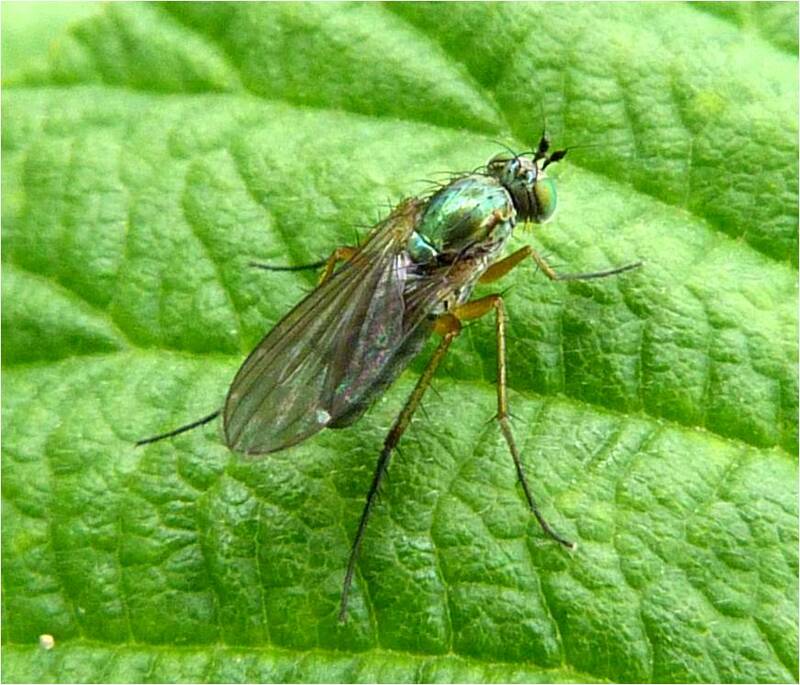 Such a sweet and innocent looking fly as well. This is a much prettier fly than it looks in this photo. It has a beautiful metallic green thorax which shimmers in the sunlight. 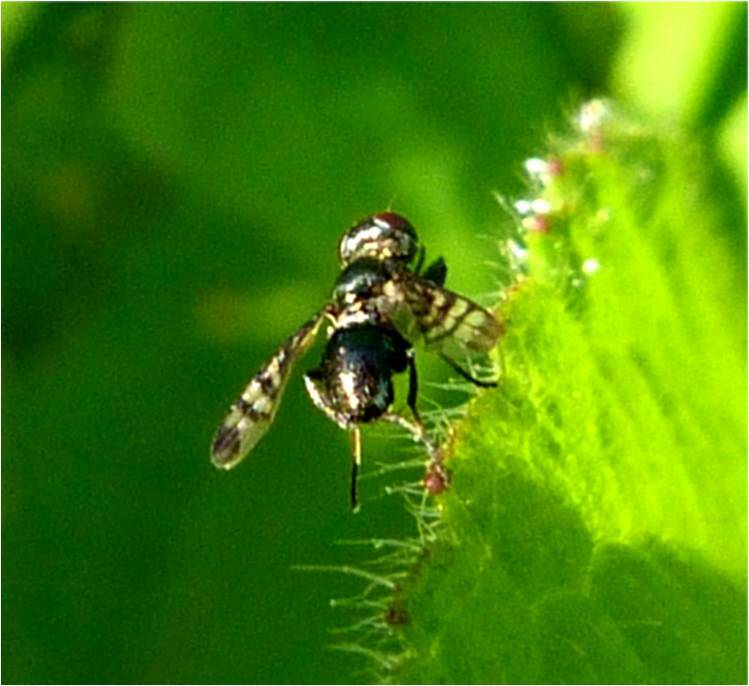 Although hard to see here, the hairs on the thorax are in fact in two neat rows. And as the name suggests, its legs are long and narrow. Many thanks to Crispin who blogged me to help with identifying this one. This poor little beauty has been saddled with a very unfortunate name just because it breeds in various kinds of dung. 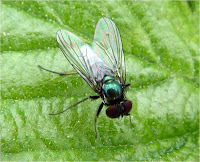 But it really is a lovely shiny little fly with a noticeable black smudge near the tip of each wing. Due to it being so small, it is very hard to get a good photo of it. 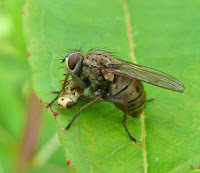 As females Sepsidae seem to have large bulbous abdomens, I think this fly is probably a female. 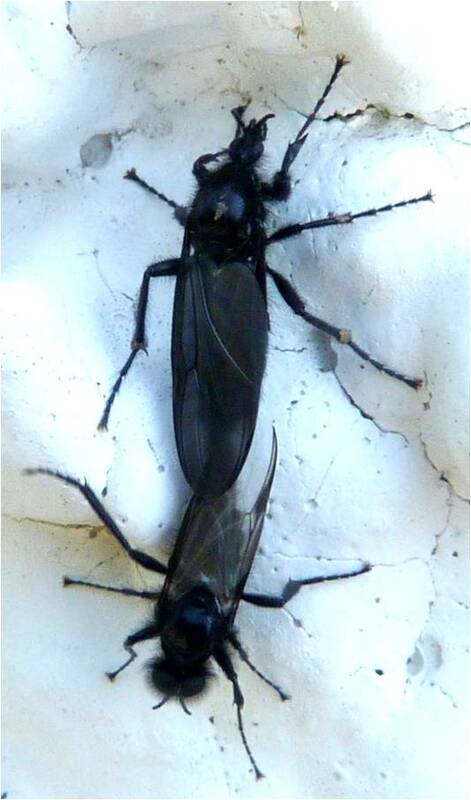 Males seem to have longer, narrower abdomens - see below. 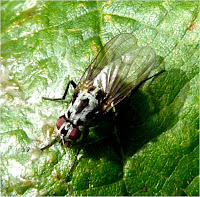 However, a microscope would be needed to verify its identity. 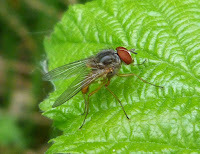 Many Sepsidae are difficult to tell apart and I cannot be certain of the identification of this one. Again, a microscope would be required to verify its identiy. 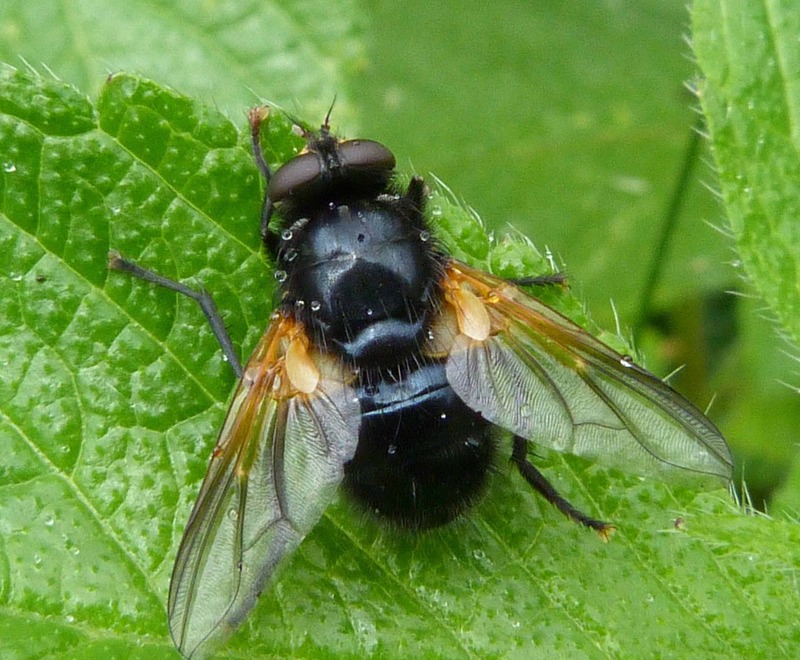 The only noticeable difference between this fly and the one above, is the lovely copper coloured abdomen which was apparent even to the naked eye despite it only being about 4 - 6mms in size. 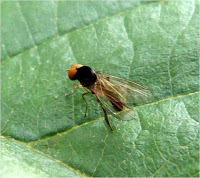 Again, I think this is a male due to its elongated abdomen unlike the more spherical abdomen of the female in the Sepsis fulgens above. 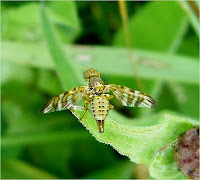 These are really stunning, brightly coloured soldier flies, although they aren't wild about having their photo taken as you can tell from this series of blurred photos. Both the male and the female have a metallic green thorax. 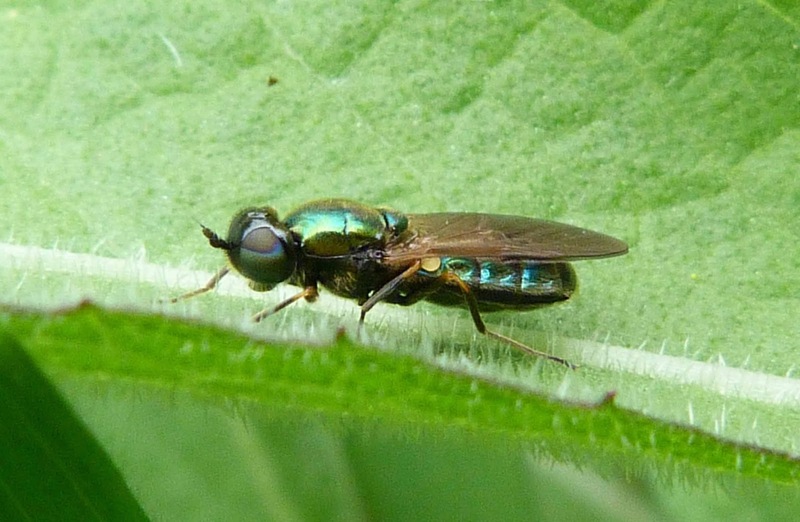 However, the female has an iridescent blue abdomen, whilst the male has a golden-bronze abdomen. At rest the wings are folded flat over the body. 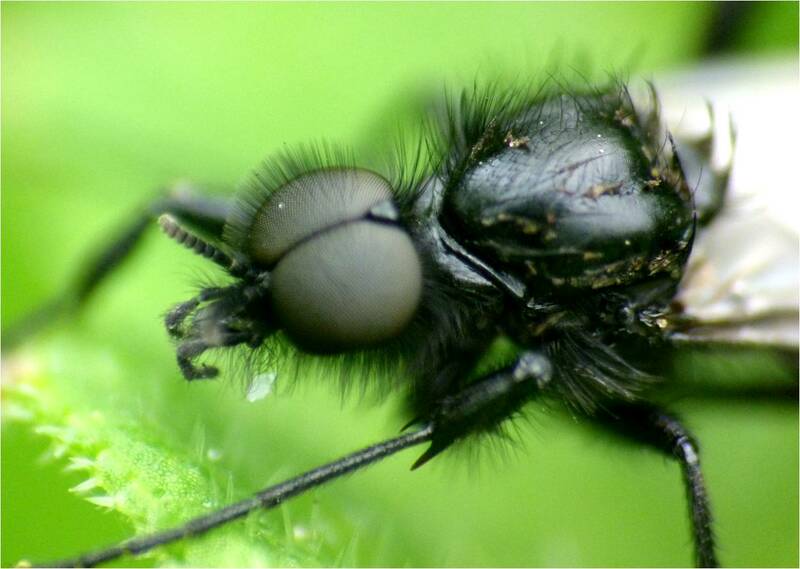 The eyes take up a large area of the head and are very hairy which distinguishes them from another similar looking soldier fly. 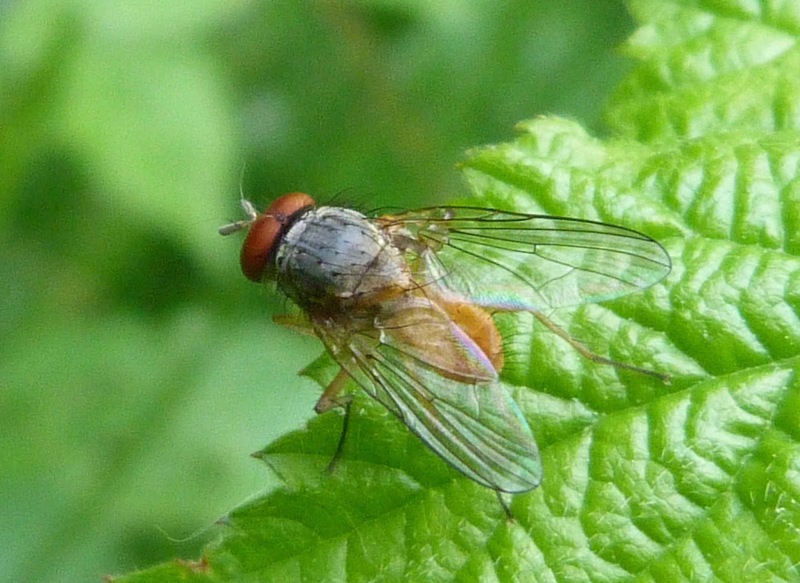 Quite a distinctive fly with long light brown legs and black 'knee-caps'. 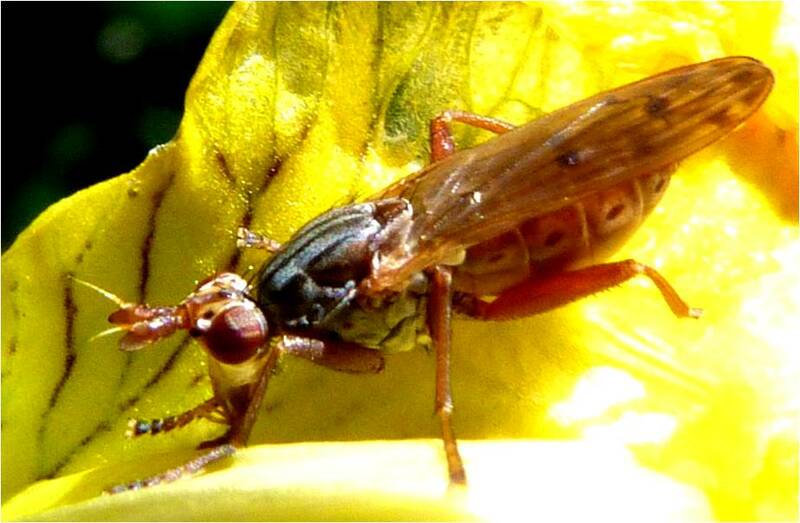 I think this one is a female as the males seem to have noticeable genitalia. I don't know what the 'orange' area is called between its eyes, but it gives this fly an attractive appearance. 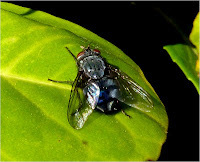 This fly was rubbing its front legs together as if cleaning or preening itself which is funny because I actually watched a Youtube video of this fly and it was doing exactly the same thing. If anyone knows why it does this I'd be interest to know, so please blog me about it. 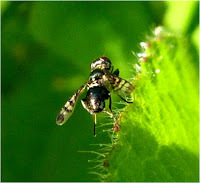 It eats other small insects such as aphids. 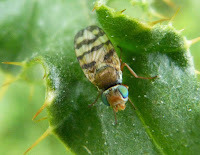 Unfortunately, the sun was going down when I took these photos, so they are rather 'noisy' and do not do this stunningly beautiful soldier fly justice. 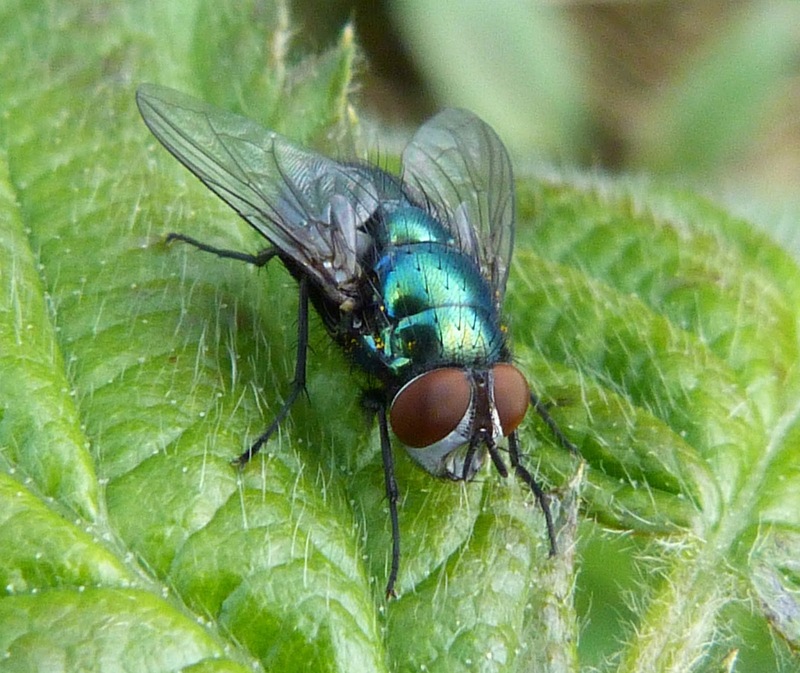 Everything about this fly seemed to shimmer with irridescent blues and greens. 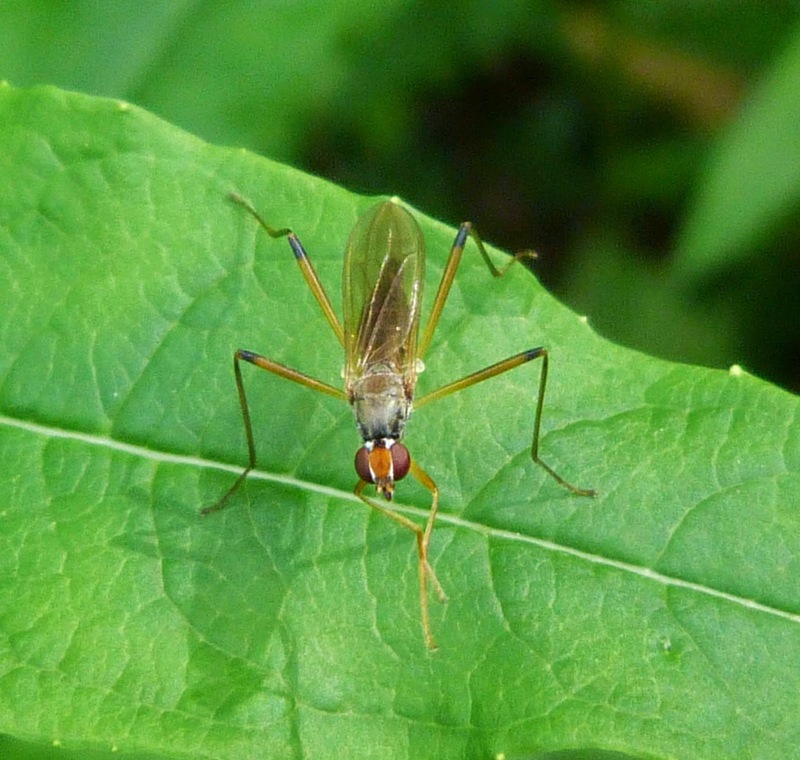 It's a fairly large insect with great big eyes that are simply mesmerising. It seems that this particular species of Sargus can be distinguished from others due, as the name suggests, to its two white spots on the females face, as can be seen on the photo on the right. For this reason, it is also known as the twin-spot Centurion.